Note: This is a guest post from Daniel, the founder of Loyal Tribe. Daniel helps eCommerce companies grow their email list, generate more sales, and build customer influence. To follow along with Daniel’s step-by-step strategy, you can use the same exact tool Daniel used: KingSumo Giveaways WordPress plugin. Or, the free KingSumo web app version. 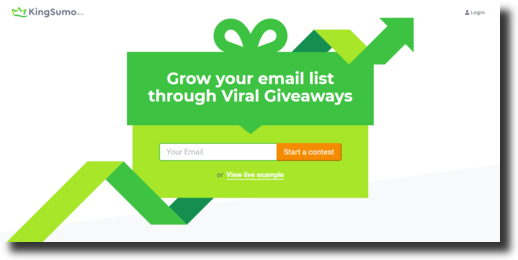 Viral giveaways can grow your email list FAST. But do those new email subscribers actually turn into new customers? We wanted to know if the email leads from giveaways were quality or just quantity. If these leads turned into paying customers… or if they were all duds. To test the theory, we used the KingSumo giveaway tool for our client Little Secrets. 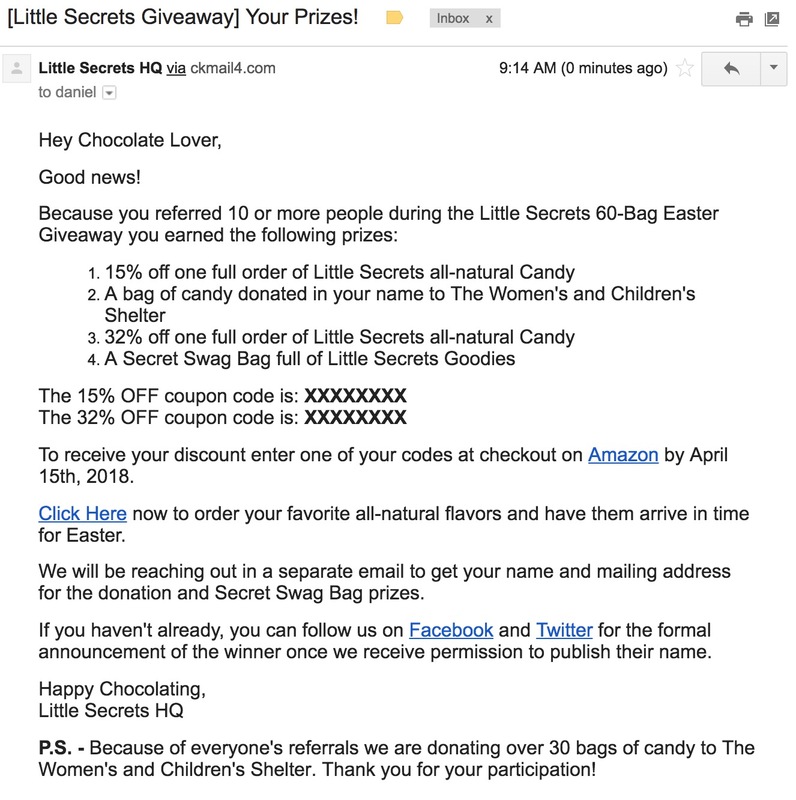 Giveaways helped Little Secrets generate email subscribers FAR faster than other marketing methods like Facebook Ads, SEO, Instagram, and influencers. The giveaway captured more leads in 7 days than we organically generated in the previous 6 months. And it wasn’t just about the leads: Revenue for Little Secrets increased, too. One week after the giveaway, the ROI on the giveaway spend was 2.26x. And our estimated annualized ROI was 27x. Awww yeah! In this blog post we’re going to show you how to have the same success with your giveaway. 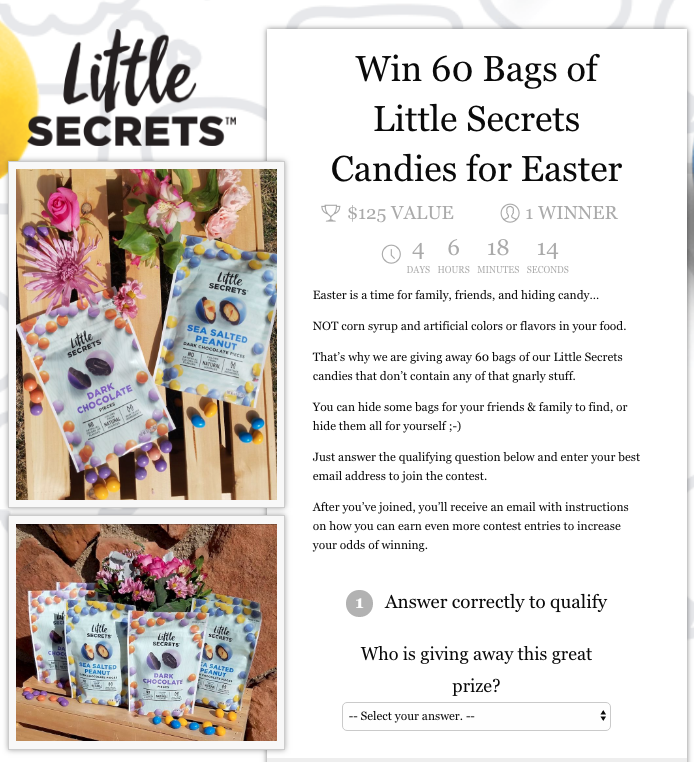 When picking a grand prize, we wanted to make sure it resonated with Little Secrets’ ideal customer. Everyone loves iPads, or Amazon gift cards… but those products don’t have anything to do with Little Secrets’ business of all natural fair-trade chocolate. A generic prize would attract low-quality leads. 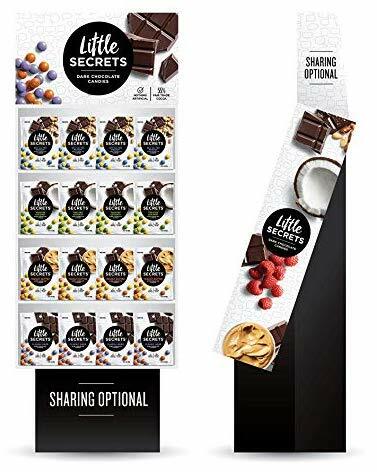 So instead, we wanted to do an eye-catching prize that fit the Little Secrets brand, attracted the right customers… and got tons of attention. We decided to make our grand prize an entire store display with 60 bags of Little Secrets candy. Imagine setting that up in your house! This grand prize only cost $125. This is less than most businesses spend on Facebook advertising in one week! A common misconception about giveaways is the prize has to be expensive. Instead, it’s more valuable to focus on a prize that attracts your ideal customer. For Little Secrets, we wanted to focus on a simple prize that got the right kind of attention. 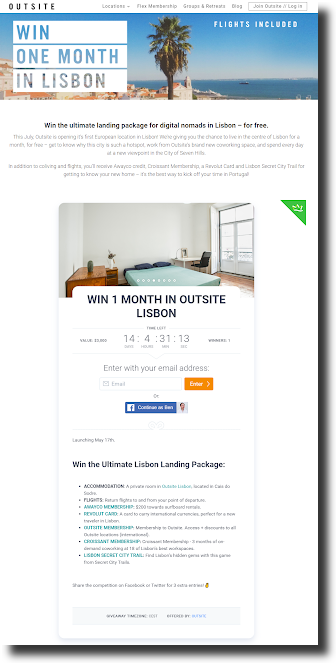 To make sure visitors knew they had landed in the right place, we created a headline that we could repeat in all of the giveaway promotions. Our headline formula = prize + time period. 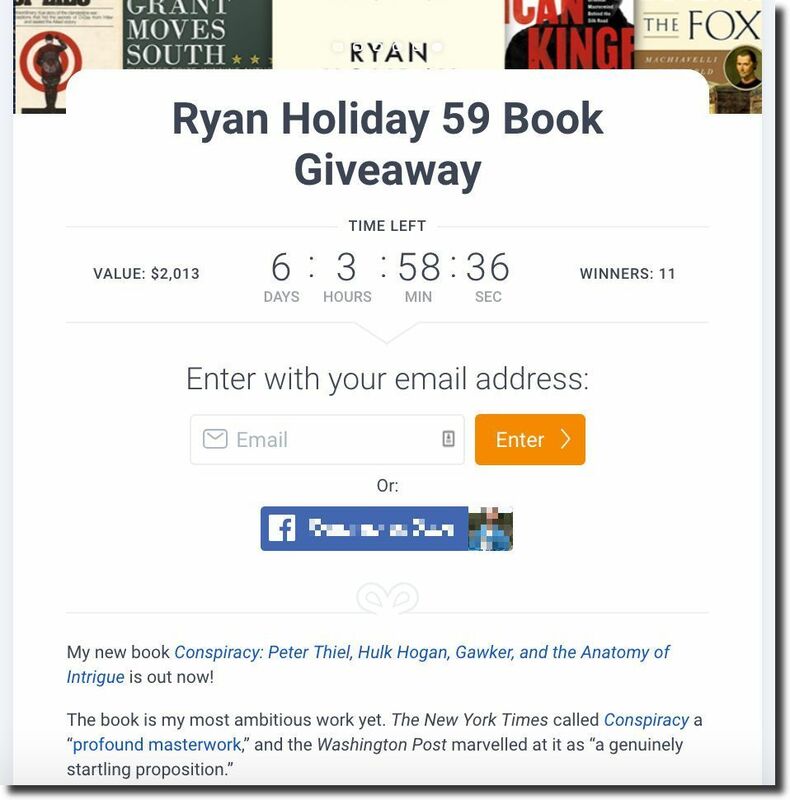 This headline was designed to entice readers to click to learn more about the giveaway. It’s easy to get distracted online, so we wanted a headline that stood out. Once users were on the giveaway page, we needed to sell them on why they should enter. KingSumo provides a great FAQ and videos if you need help setting up your giveaway. Remember that users are distracted when reading your giveaway page — with social media, YouTube, kittens, and other giveaways — so you have to grab their attention. Think like a user, and ask yourself: Why should I care about signing up for this giveaway right now? Write copy with your ideal user’s experience in mind. Little Secrets uses Facebook as its social media channel of choice. To leverage their existing Facebook audience, we focused on making it easy for contestants to share the giveaway on Facebook. We could have focused on trying to grow the Little Secrets Twitter, Instagram, or YouTube followings as well — but asking people to do too many things leads to analysis paralysis, and they’ll end up doing nothing. Through experimentation, we’ve found that focusing on one social media channel maximizes the final results. 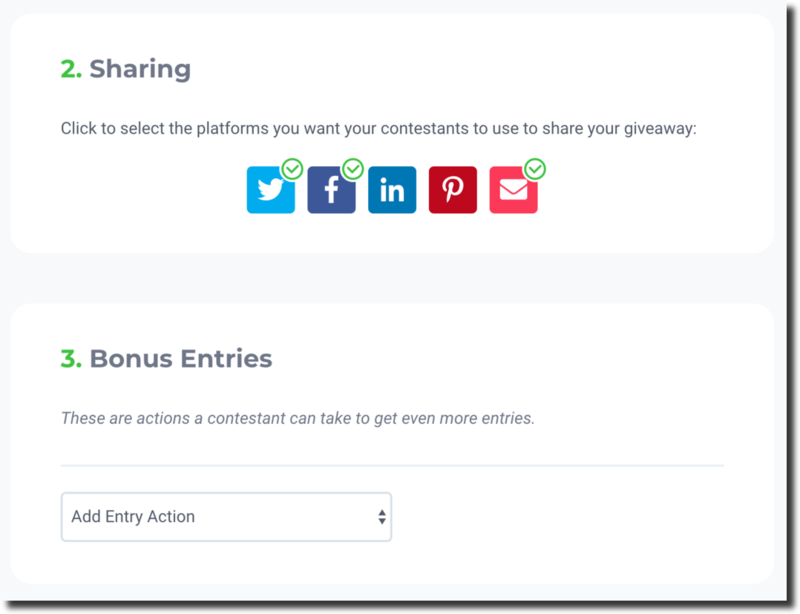 The Sharing Options allow contestants to share the giveaway on Facebook with one click. Seriously, one click leads to tons of free promotion on Facebook! 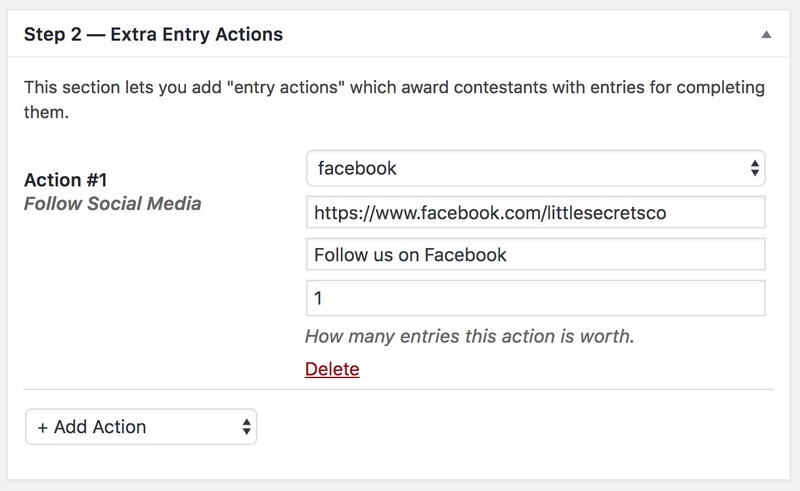 And the Extra Entry Actions gives contestants an additional giveaway entry for following Little Secrets on Facebook. To enable this additional entry, we added Facebook as a “social media follow” action. This feature took 30 seconds to set up, and resulted in an additional 161 Facebook followers over the course of the giveaway! Here’s an example of what these options looked like on the giveaway page after someone had entered. In giveaways, there’s usually only one winner. This can be defeating for would-be entrants. People come to your giveaway page, think they have no chance, and decide not to even bother entering. 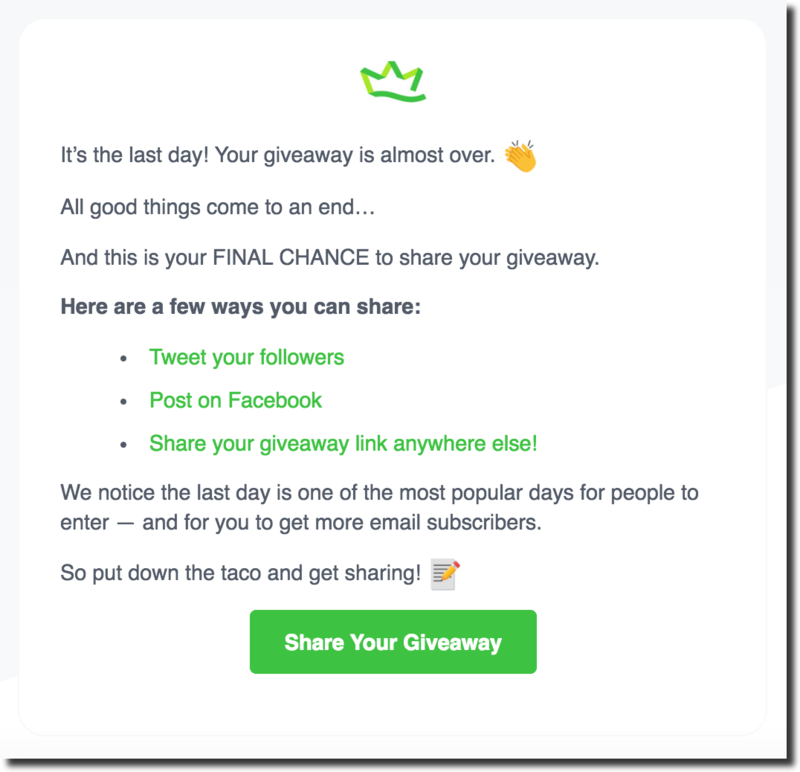 They exit the giveaway… and cost your business another lead and potential customer. To increase our number of entrants, we tested offering guaranteed prizes to people that referred others to the giveaway. Notice how we don’t give away a product until they refer at least 10 people! In other words, 1 referral and 5 referrals require the entrant to purchase something… which means we generate revenue (even if it’s at a discount). The best way to encourage people to refer their friends, get guaranteed prizes, and help grow our giveaway was through a confirmation email. We included a link back to the contest page four times in the copy to make sure everyone knew where to go if they wanted to refer someone and earn the guaranteed prizes. This email had excellent results — a 62.7% open rate and 13% click rate. That’s 3x the results of a normal email. 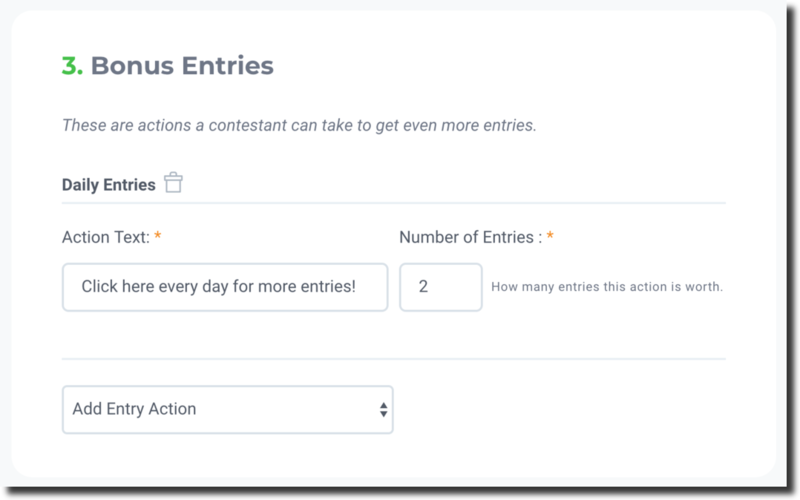 To make sure this email went out immediately after confirmation, we integrated our email provider with the KingSumo services tab and chose the “Push contestants after they confirm their entry” option. Using this setting, KingSumo sends the contestant’s email address to the email provider only after they confirmed their entry into the giveaway. This way any non-confirmed, potentially fake entrants, were not sent to the email provider. 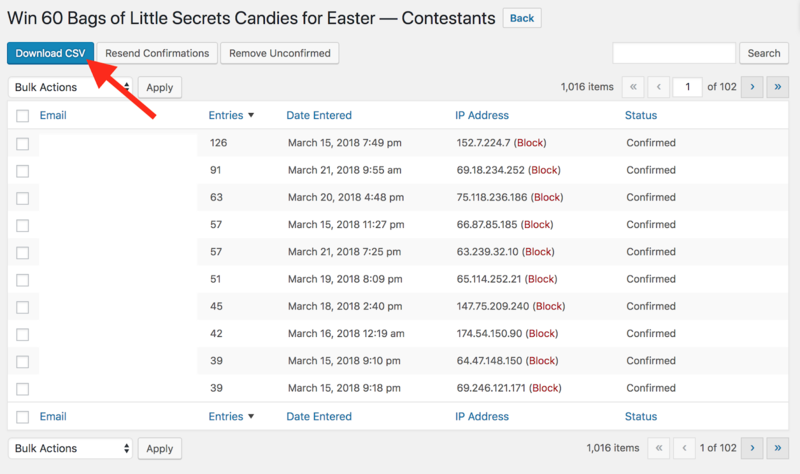 Starting the process with a tag allowed us to identify entrants in our email provider so we could track and segment them later in the giveaway. One contestant referred 41 people!!! This confirmation email worked to help us increase our giveaway leads by more than 10%. The engagement for a giveaway will drop off in less than a week without constant promotion. 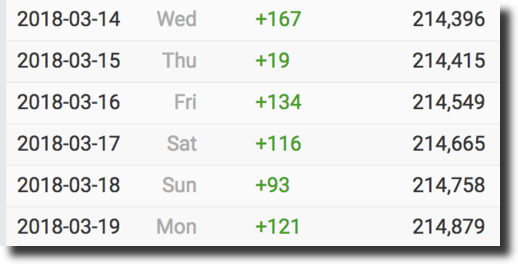 If you look at our overall subscriber numbers below, you’ll see a spike on day one, a dip for the next five days, and a spike again on day seven. The first and last days of the giveaway accounted for 90% of new subscribers. If you want to really grow your subscriber list, it’s important to send reminders on the first and last day. Notice how the majority of subscribers came from the first and last two days of the giveaway. But if no one entered, it didn’t matter. With our giveaway set up, it was critical we promoted the giveaway effectively to get more leads and new customers. Here are the exact steps we used to promote our giveaway for massive success. To grow the Little Secrets email list organically, we used KingSumo’s sister company Sumo and their free list growth tools. 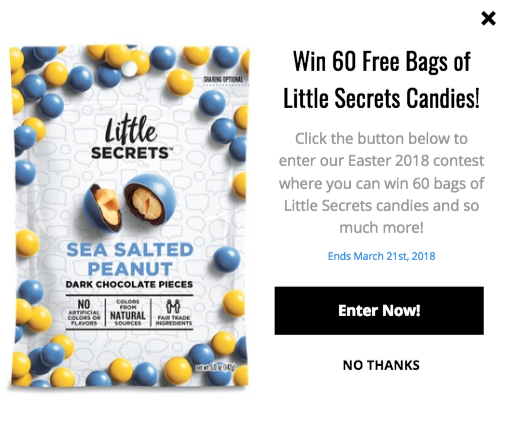 Using the free Sumo tools, we put popups on every page of the Little Secrets website promoting the giveaway. The Sumo tools allowed us to create effective popups in minutes, instead of the hours it would take to manually code. Here’s the popup we created with a simple image, title, and copy. You’ll notice, for ease and consistency, we reused a lot of the same copy and style as our giveaway page. 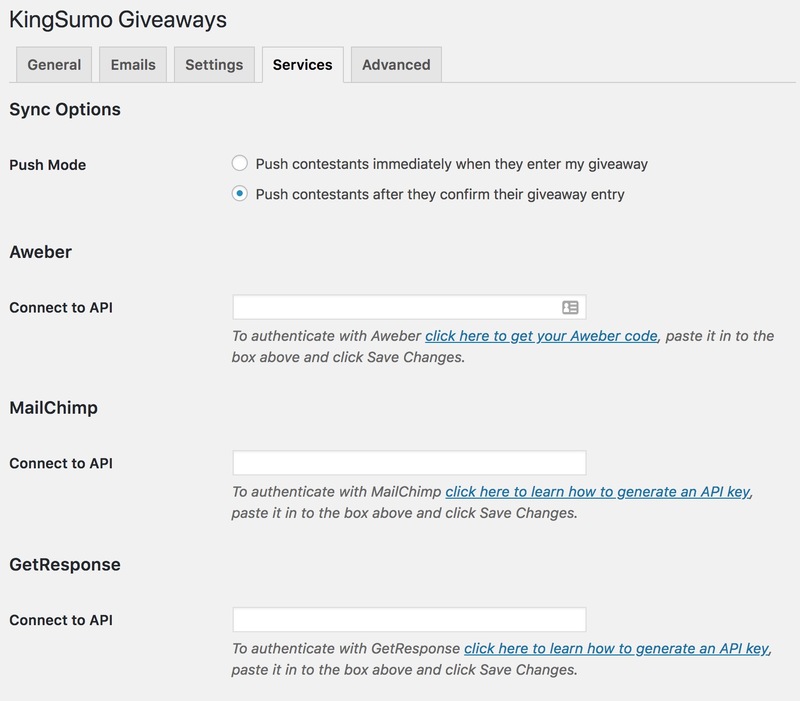 When a user clicked the “Enter Now!” button, it redirected them to the giveaway page we had set up in KingSumo. But what about all the customers who had bought from us in the past? Or signed up for our email list? Most existing fans aren’t checking our site every day, and they won’t see the popup. Instead, they’re waiting for us to reach out to them again. 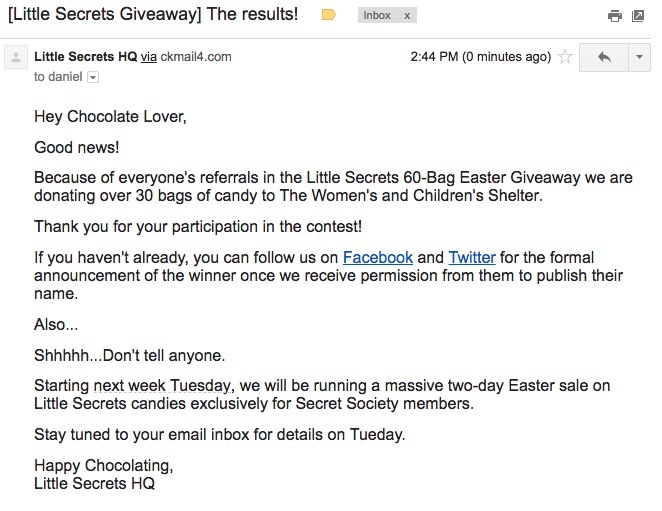 To help the giveaway go viral, we sent an email promoting the giveaway to the Little Secrets email list. We wanted to keep the giveaway offer as consistent as possible. In the body of the email, we wanted to give a compelling reason for subscribers to enter the giveaway. 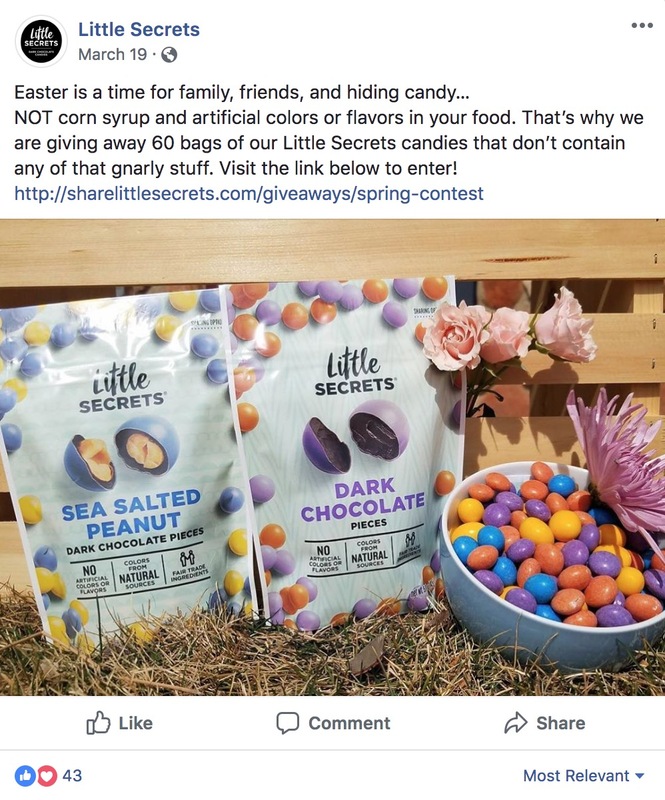 We positioned the giveaway around Easter and eliminating artificial, unnatural candy from their family celebration. We also used the “frame the dream” approach in the body copy. In other words, we asked them to imagine how many smiles they could create with 60 bags of hidden candy for friends and loved ones. Finally, we made a last-ditch effort for the people who still weren’t convinced. 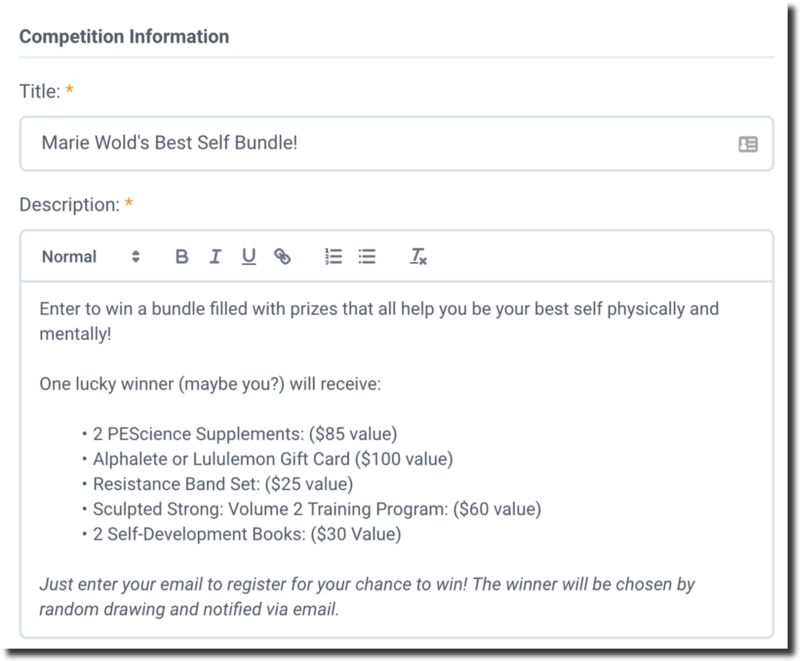 We mentioned the guaranteed prizes in the PS of the email to help skeptics see the value and take action. Here’s the exact announcement email we sent to our existing email list. The email was VERY effective. There are multiple subreddits on reddit that are dedicated to giveaways and sweepstakes. Most people avoid these subreddits because they think they will only result in terrible leads. But we thought about reddit differently. It takes 5 minutes to post on reddit, so if we generated at least one customer from reddit, we would make about $25 in revenue or $300 per hour worked (not too shabby). For the experiment, we posted the giveaway on the subreddit r/giveaways to reach the largest number of potential new customers. It was also important for us to get upvotes to our reddit post. This would help it stay on the r/giveaways homepage longer. Plus, the more a post is upvoted, the more reddit’s algorithm features it across their site. Free advertising! To get more upvotes, we had all our team members sign up for accounts and upvote. Then, we texted the link to a few friends, too. Social media would give us the chance to turn even more fans and followers into entrants. Some followers were already on the email list, but a good number of them were not. Also, not everyone is going to open the announcement email, so it always pays to communicate on multiple channels. We decided to start our social media push by leveraging Facebook — the biggest social media platform for Little Secrets to get the most eyeballs. 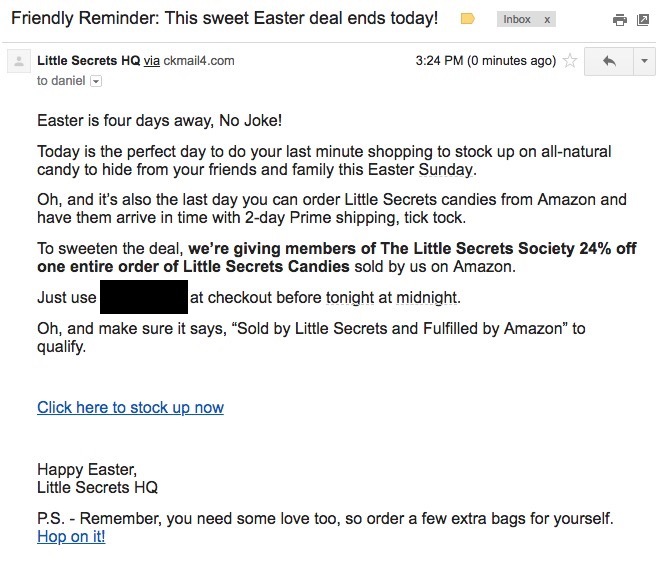 Similar to the email, we positioned Little Secrets as a way to remove artificial flavors from your family’s Easter celebration. We didn’t spend any money to promote this post, so this was all organic engagement. A nice surprise was that followers grew 4% over 7 days. It wasn’t our primary goal to grow the Little Secrets Facebook fan page, but it was a nice bonus. 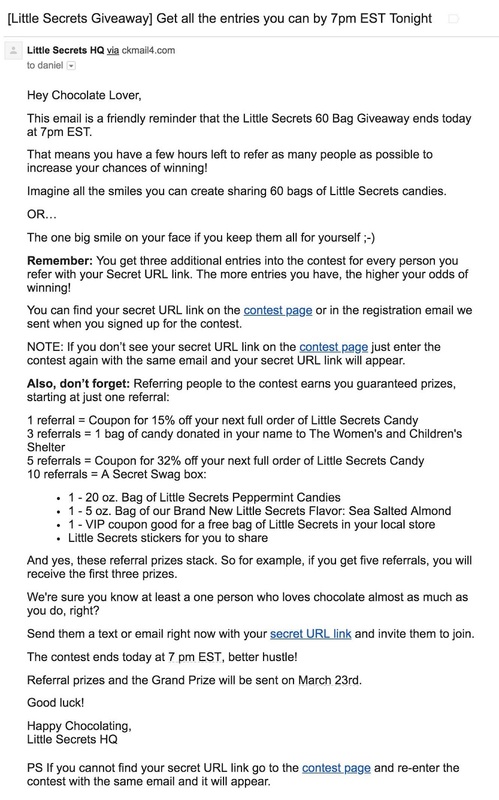 Every day of the giveaway, Little Secrets was getting between 25 to 250 new email subscribers. However, not all of the entrants were confirming their email address and entry into the giveaway. And because they didn’t confirm their entry, they weren’t going to see the confirmation email with instruction on how to refer their friends and win guaranteed prizes. In our experience, the last day of any promotion generates 40% or more of the results when you send a deadline reminder email. To make sure Little Secrets did not miss out on a ton of additional leads, we needed to send two different reminders. Once we had the CSV of the contestants, we used Microsoft Excel to sort them by confirmed or unconfirmed status. 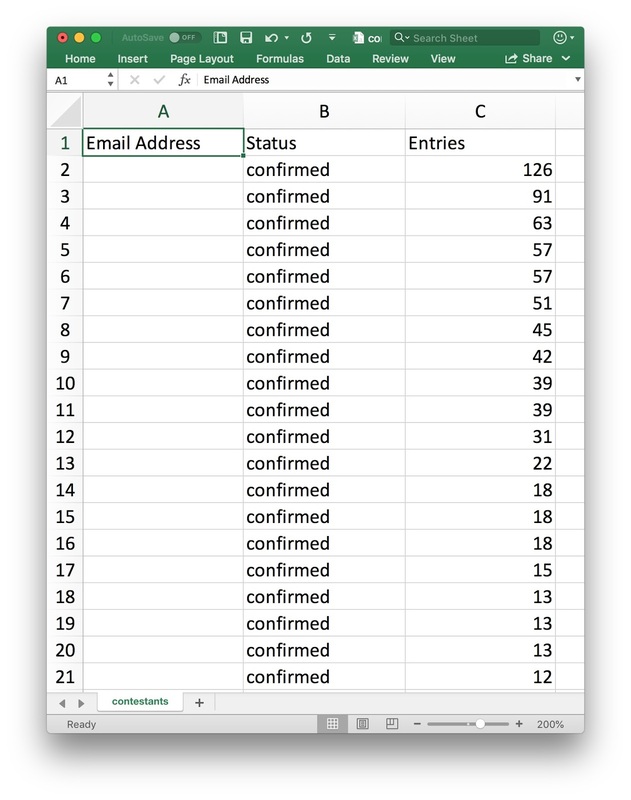 We used the sort function under the Data menu in Excel. In the body, we also used compelling copy to help unconfirmed entrants visualize what it would be like to win the main prize. Also, in the PS, we teased the secondary benefit of confirming your entry for additional guaranteed prizes. Notice the multiple deadlines we added to the email. This email was sent to existing subscribers who had not entered the giveaway, and unconfirmed entrants… but we still managed to get a 38.3% open rate and 9.3% click rate! That’s 2.5x normal email averages. Great for a “cold” group of users who didn’t enter the giveaway the first time! We also sent another email reminder to all the confirmed giveaway entrants. 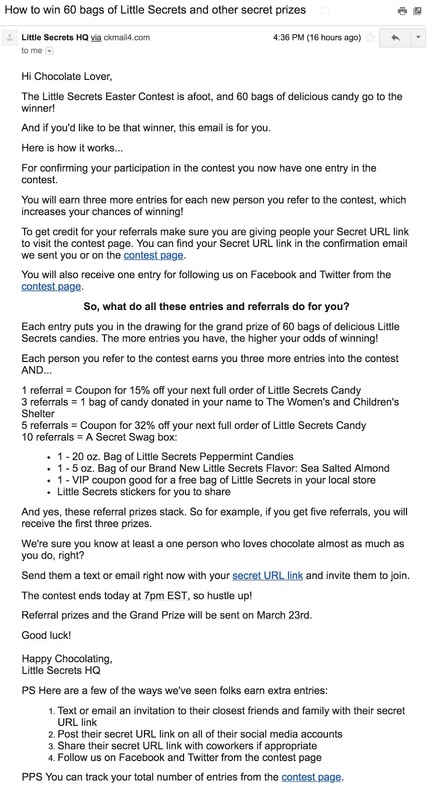 This email was designed to generate more guaranteed prizes for the entrants and more referrals for Little Secrets. 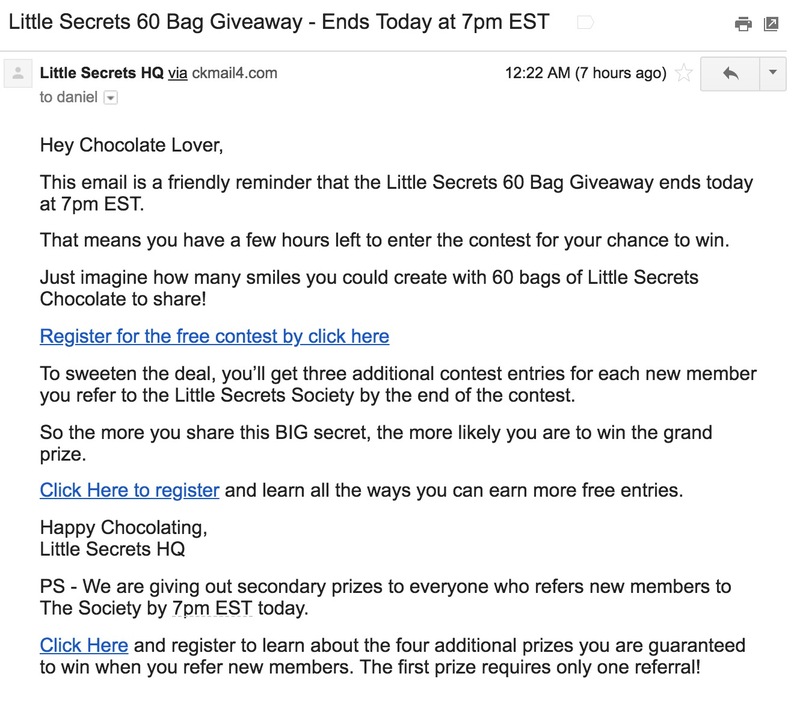 In total, these two emails DOUBLED the number of entrants, and new subscribers, to the Little Secrets email list. Seriously. Just two simple deadline emails to a group of unconfirmed and confirmed users 2x’d the entrants. That’s the power of a deadline. Just because the giveaway is over doesn’t mean the work is done. The best giveaway creators know that post-giveaway follow-ups are critical to turn entrants into customers and get a return on their giveaway campaign. Here’s how to turn your giveaway entrants into raving fans and lifelong customers after your giveaway ends. No one likes to find out they lost a giveaway. We made sure everyone who participated was a winner at the end of the giveaway. After the giveaway was over we exported a new CSV and sorted contestants by how many entries they received. Our most successful contestant referred 41 people! Because everyone who refers a friend gets 3 additional bonus entries, the guaranteed prizes started at 4 entries (1 entry for entering themselves, 3 for referring a friend). After sorting entrants in Excel, we uploaded each group into the email provider and tagged them with the appropriate prize level. We allowed entrants to stack their referral prizes. In other words, if someone referred 10 people they got all the prize levels. Sweet bonus! An 80% open rate and a 14.3% click rate average for the guaranteed prize emails. This click rate is even better when you consider that two of the four prizes required someone to buy Little Secrets in order to get a discount. That’s free revenue for Little Secrets. 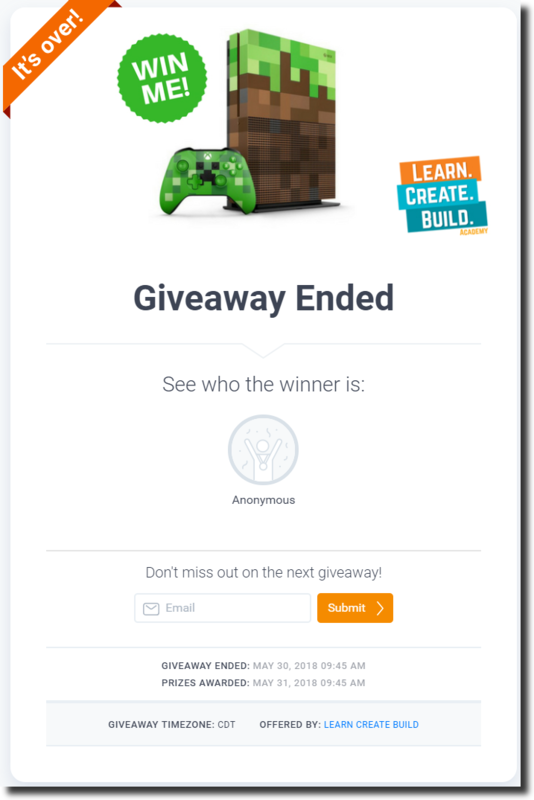 Many giveaway creators will drop giveaway entrants into the middle of their email sequence. Think about how confusing this is for the entrant: These people are new to your brand, and you’re treating them like you’ve known them for a while. It makes your emails feel weird and transactional. We wanted to make it easy for new subscribers to understand the Little Secrets brand, so we crafted a special post-giveaway email for them. 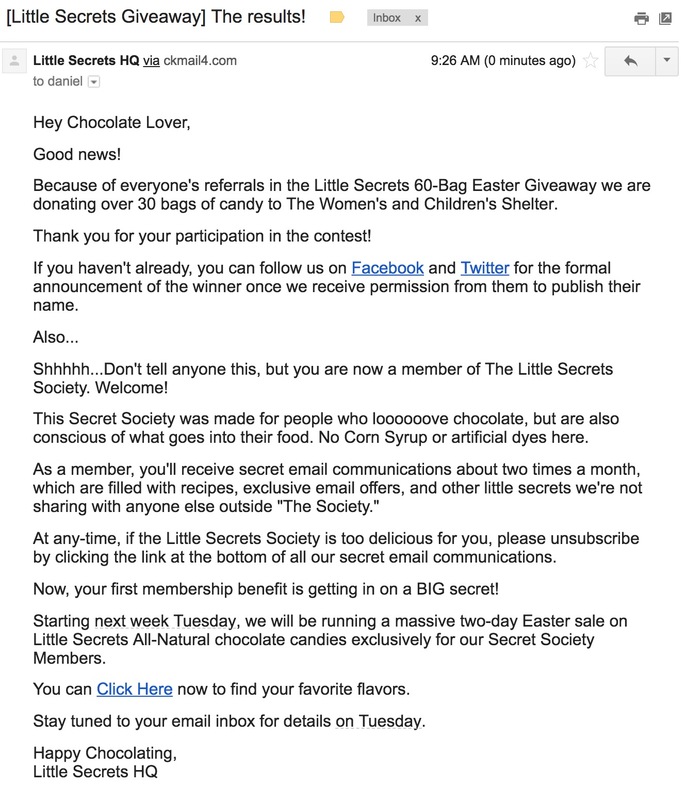 Part 1: The email welcomed entrants to the Little Secrets email list, and told them how the giveaway helped donate chocolate to people in need. This was the “feel good” hook to keep reading. Part 2: We talked about where else new entrants could find Little Secrets on the web. 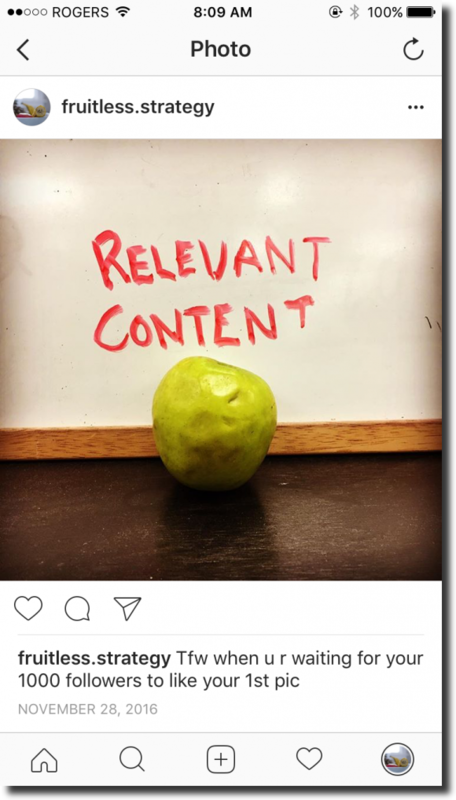 This helped people learn about the brand… and it also helped grow their social following. 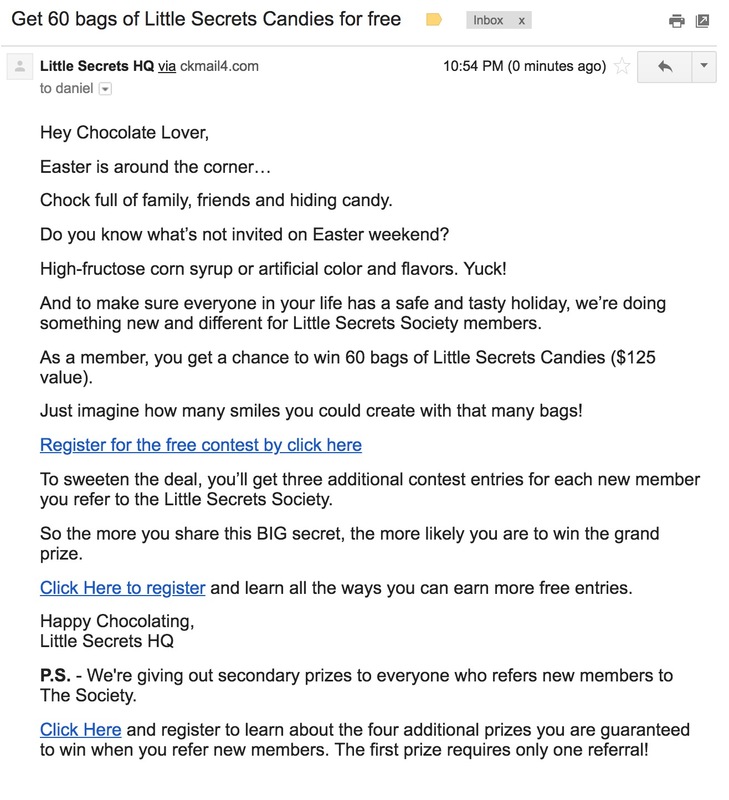 Part 3: We invited entrants to say on the Little Secrets Society (the email list) — and enticed them by mentioning the BIG Easter sale. The results were a 57% open rate and a 8.1% click rate. Every click went to high-intent pages for Little Secrets: the Twitter page, Facebook fan page, and store. For existing email subscribers who entered, we sent a different email. Everyone who entered the giveaway AND their subscription date was before the start of the giveaway. We sent a similar email as the new subscribers, but removed the section that explained the secret membership since they were already subscribers. We got an 84% open rate and 4.2% click rate on this email. This meant more Facebook and twitter followers for Little Secrets. Nice! These open rates are proof that maintaining an engaged list is crucial — and if you do it right, then your open rates, click rates, and sales will continue to increase. 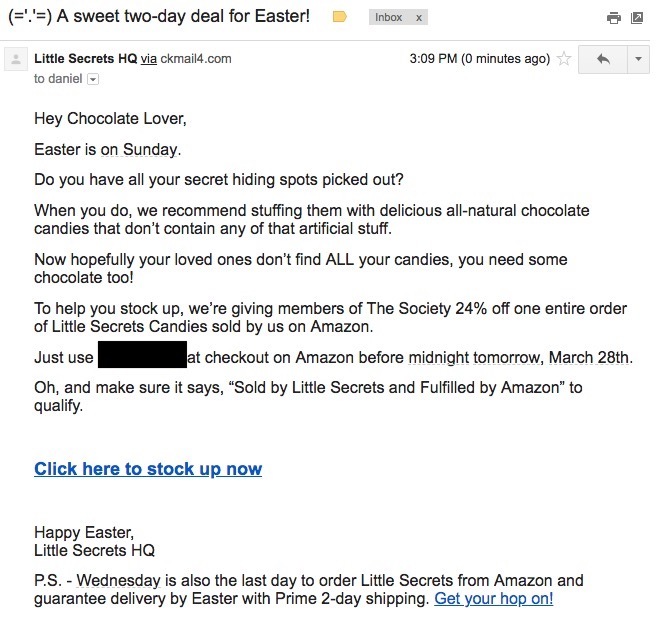 The week after the giveaway ended, we sent a 24% off promotion to everyone on the Little Secrets email list. From the giveaway, we had increased the Little Secrets email list by 56%. We purposely planned the sale immediately after the giveaway so the new subscribers had an opportunity to buy before they forgot all about Little Secrets. You don’t need a seven-part launch sequence to sell your product. Instead, just make an offer ASAP while your new subscribers are still engaged. The email got a 38.7% open rate and 7.2% click rate. All these clicks went to the Little Secrets product page on Amazon, and many of them converted into new and repeat customers. This email got an 11.7% open rate and 0.5% click rate. It was lower than the other emails, but we were still happy with the results. It was a less engaged segment that didn’t open the previous email. The giveaway was a massive success for Little Secrets. Not only for growing the Little Secrets email list, but also for converting new subscribers into customers at a profit! If we would have spent the same amount of money on Facebook advertising or SEO, the costs would have been much higher. Little Secrets made $1.23 for every new email subscriber they collected during the giveaway. And based on past performance, we know that each email address added to the Little Secrets email list is worth $20 a year. This means over the next 12 months, entrants from this giveaway will add an estimated $12,680 in sales! Because of the booming success of this giveaway, Little Secrets plans on running multiple giveaways a year. It’s easier than you think to run your own giveaway. Thanks to KingSumo handling all of the technical hurdles, running a profitable giveaway is now easier than ever. And combined with the strategy outlined above, we’re confident you can turn your giveaway into a profit machine too! I’ll personally be answering every single question in the comments for the next seven days. If you have any questions or comments, please click here to leave a comment and I’ll reply. Daniel Reifenberger is the Founder and Chief Marketing Strategist at Loyal Tribe, an agency that helps eCommerce companies add 10-30% more revenue with email marketing. Last year, we ran a giveaway for 9 of our favorite travel items. And our giveaway partners saw their sales increase! Create a discount code for your product. 🤑 For example, if you’re an author you can offer an Amazon coupon for 50% off your book. Or, if you’re not giving away a physical prize, you can offer a discount on an hour of your consulting time. Make sure to set an expiration date on your discount. ⏰ Setting a deadline helps people take action fast. Export your entrants. 📧 Click here to access your KingSumo dashboard. 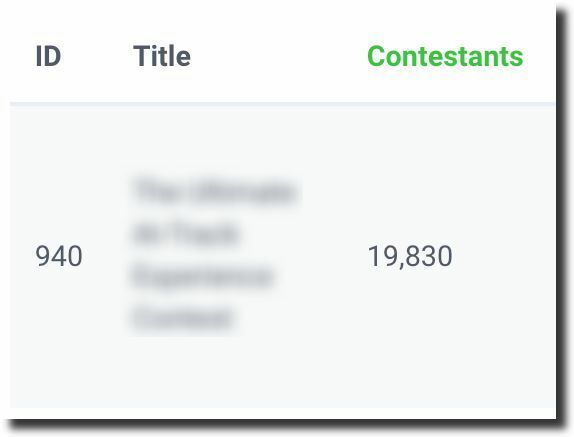 Export all your entrants by clicking on the green “Contestants” and then exporting as a CSV. Prepare the email. 🤓 You can import the CSV of entrants directly into your email service provider in a new list or tagged as “giveaway entrants”. Write your email. 📝 We recommend you include 20-50% off discount codes. Make it compelling so your entrants become customers. Once your email is setup, we recommend sending 12 hours before your giveaway ends. Why do some giveaways succeed… while others fail? Here are 3 giveaway tips to help take your giveaway to the next level. Use these tips to get more email subscribers, customers, and social media followers. Promote using Facebook Ads. 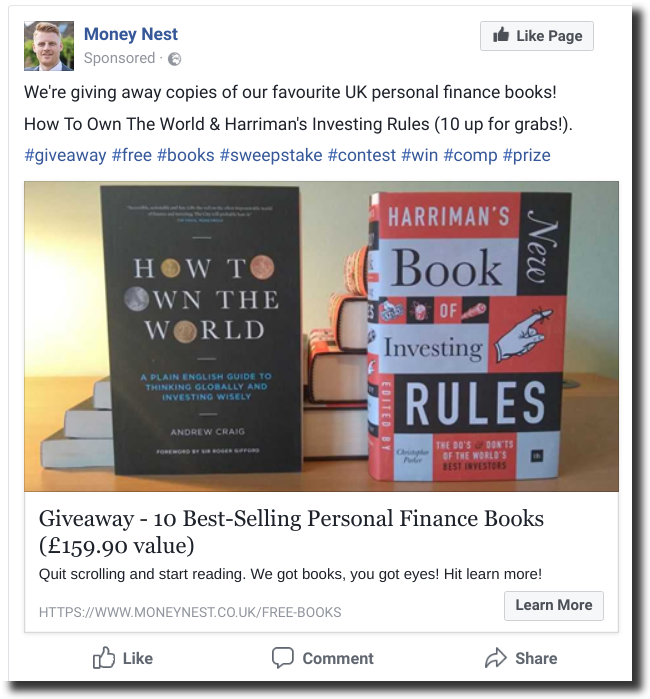 💸Facebook ads can be an inexpensive and effective way to drive entrants to a giveaway. 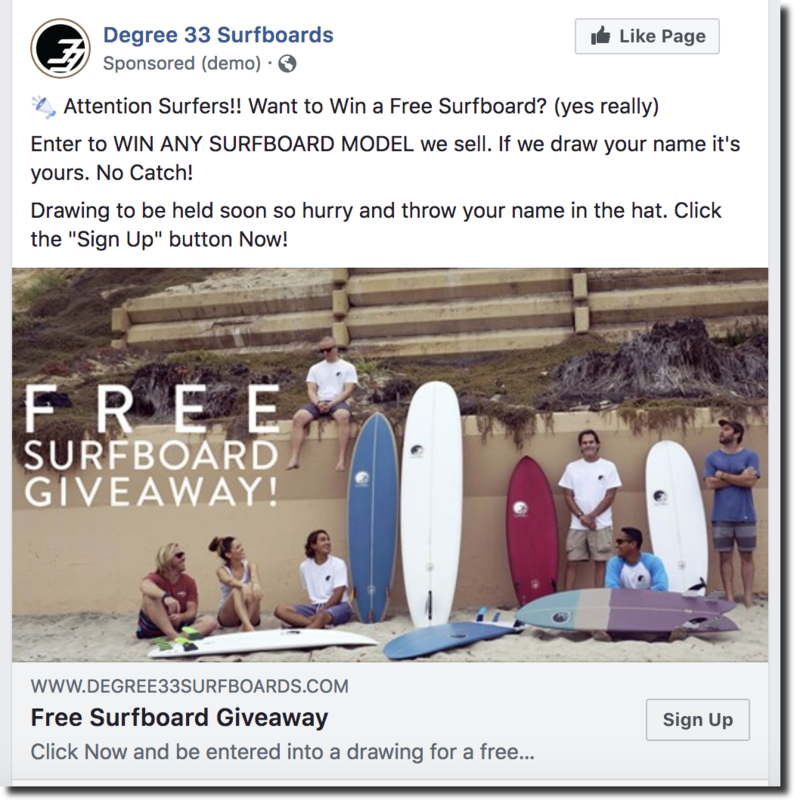 Surfboard company Degree 33 is using Facebook Ads to run monthly giveaways.For the most effective giveaway ads, target Facebook users with interests similar to your brand. For example, if you’re a surfboard company you can target people located in California who like the pro surfer Kelly Slater. After you set up your budgeting and target, create a benefit-driven ad to appeal to your target audience. We just added Facebook Pixel conversion tracking to the KingSumo web app Pro plan. Click here to enable. Do a partner giveaway. 👨Additional partners can help you massively grow your giveaway. SaaS business MeetEdgar got 2,000+ entrants by featuring 3 partners.Use BuzzSumo, LinkedIn, or Google to find complementary products. Then, use Hunter to find email addresses for the products and companies you found. Many companies will be receptive to giving you a free product if you feature them in your giveaway social media posts and emails. I LOVE [product]. Use it all the time, my favorite thing is [your favorite thing about their product]. I’m running a giveaway for my readers. Gonna promote to [# of followers you have] on my social and email channels. Would be excited to give away [product] + link to your site. Leverage daily entries + embed. 🎉Daily entries and embedding your giveaway will get users to visit your site more often. Art blog Hyperallergic embedded their giveaway to get 7,000+ entrants.Create a website landing page to put your giveaway embed widget. 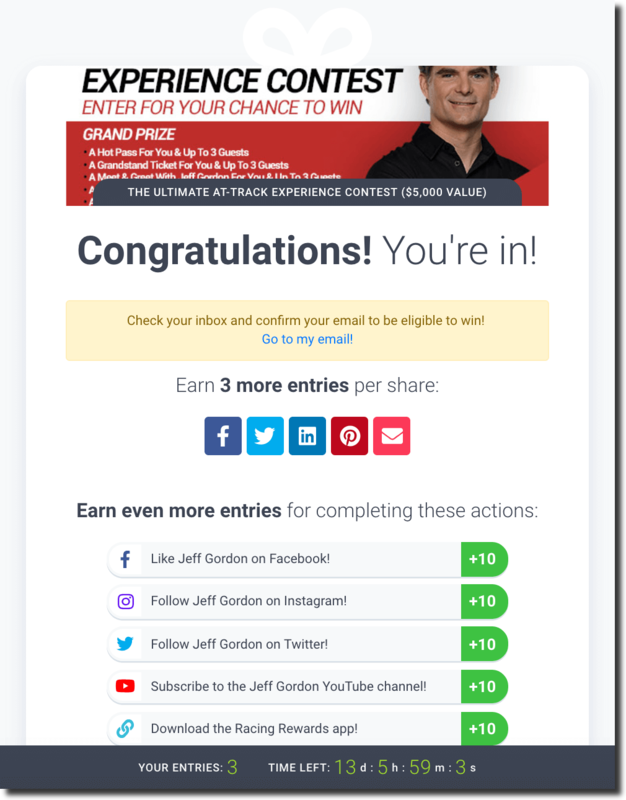 On your giveaway landing page, you can also put additional call to actions — like links to buy your products, videos, or anything else. Finally, embed the widget on your landing page and promote it. Post your landing page on social media, share it to your email list, tell your friends, post on LinkedIn, and anything else you want. Make sure to mention entrants can get bonus daily entries if they visit the page every 24 hours so they come back to your site. And because of our Late Entries feature, even when the giveaway ends you’ll collect email addresses! Gleam Alternative: How Does KingSumo Compare? You’re looking for an alternative to Gleam for running giveaways — something cheaper or free, with better features. Today, we’re going to talk about Gleam alternative KingSumo. That’s a 775% increase over their normal growth! 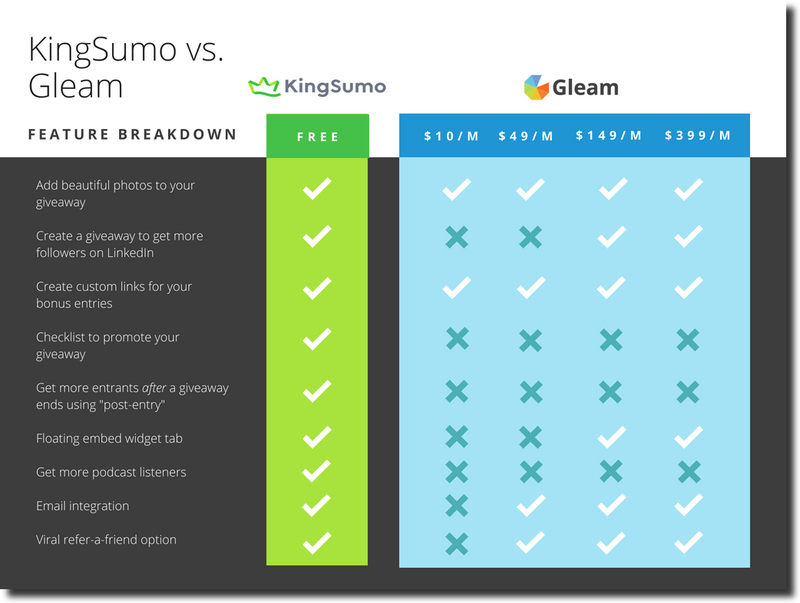 In this post, we’re comparing Gleam and KingSumo side-by-side so you can make the best choice for your business, brand, and website. You can start your giveaway with KingSumo in under 5 minutes. Just type in your email address and start setting up for FREE. Gleam’s sign up process takes a few extra steps. Set your start and end date to ANY duration you want. Want to start a giveaway today? No problem. Or, start it a month from now… whatever you want! On Gleam, adding prize photos to your giveaway is only reserved for paid users. 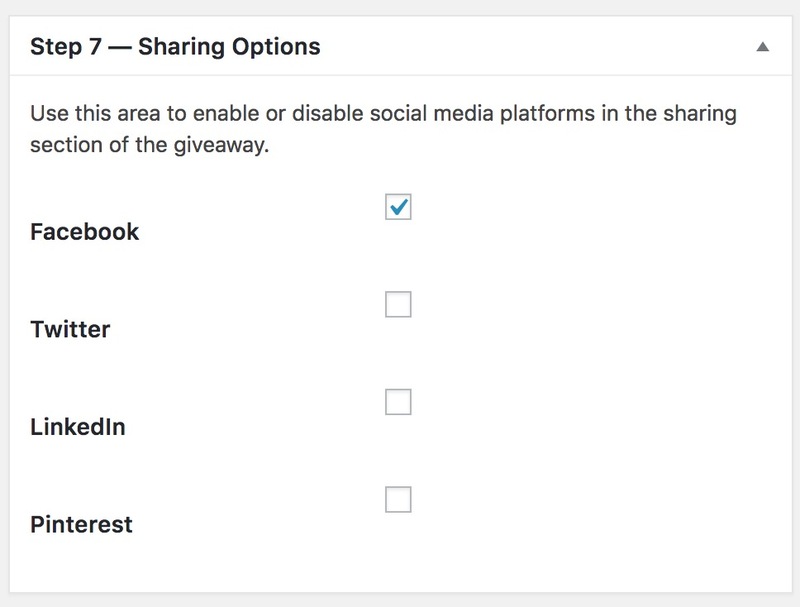 After you add giveaway information when setting up KingSumo, you can pick your Sharing options. 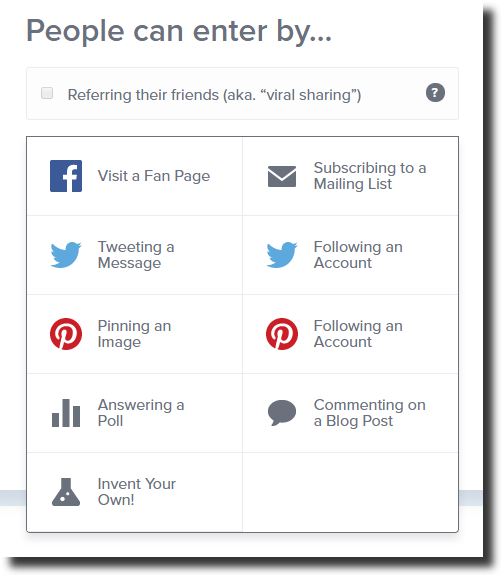 These sharing options allows an entrant to one-click share the giveaway with their friends on a handful of social networks. It benefits the entrant because it increases their chances to win. And it benefits the giveaway admin because it helps the giveaway go viral and the admin to get more social followers. Win-win. Some giveaways using KingSumo have grown 2,000+ social followers because of this feature! Gleam has tons options to get extra points too by visiting a Facebook fan page, following a Twitter page, and more, too. Some are free, but when you look closer many are paid only. Where Gleam stops, KingSumo keeps on going. 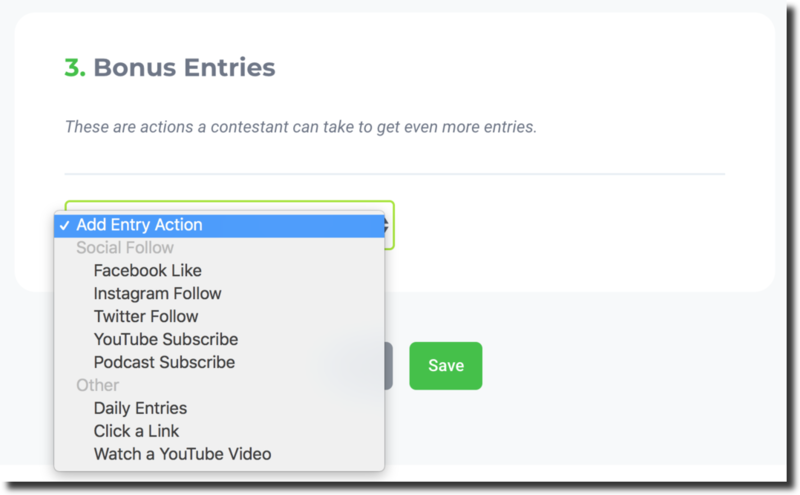 In the Bonus Entries section, KingSumo gives creators tons of freedom to create actions that help grow their business, website, or social following via a giveaway. Watch a YouTube video (only for paid Gleam users). Imagine having hundreds of people watch your best content on YouTube, subscribe to your channel, and helping make your YouTube channel more popular! After putting your finishing touches on your giveaway, it’s time to launch and make it go viral. On Gleam, after you save your info and you’re ready to launch, you have a few options to promote the giveaway. Embed your giveaway on any page or post. A standard for all giveaway tools so you can can show your giveaway on your website. Add a tab to your site. Have a tab on your website that triggers your giveaway in a pop-up when clicked. The tab feature is only for paid users. 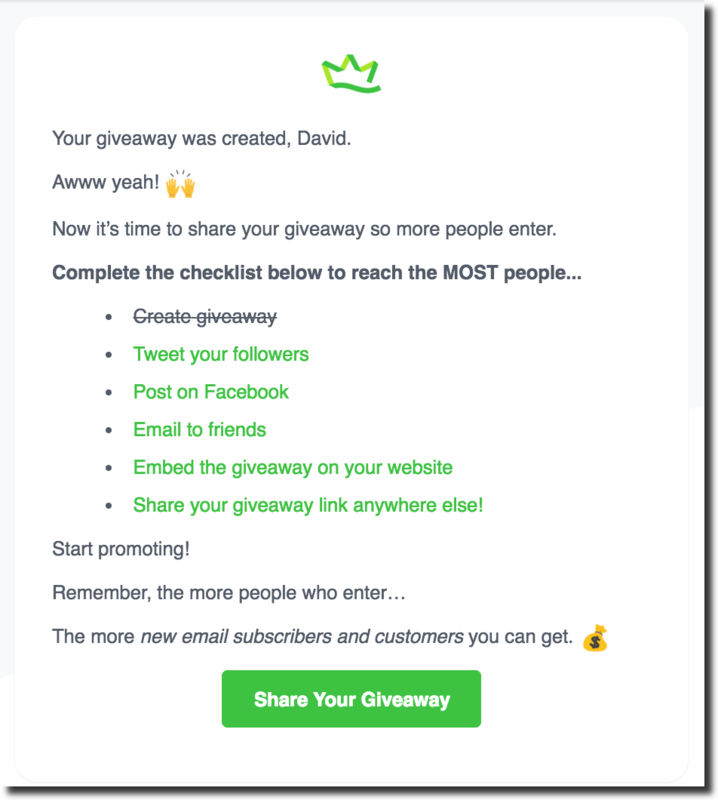 On KingSumo, after setup, you’ll get an actionable step-by-step marketing checklist to launch your giveaway successfully. 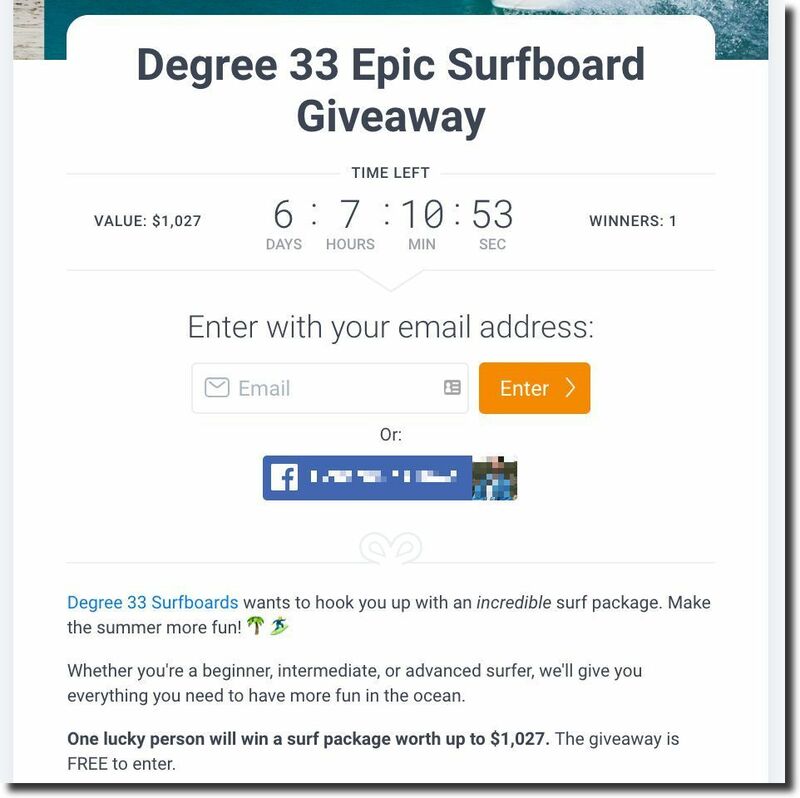 Like Gleam, You can start by embedding your giveaway widget on any page of your website. You can use this to build KingSumo around your brand. 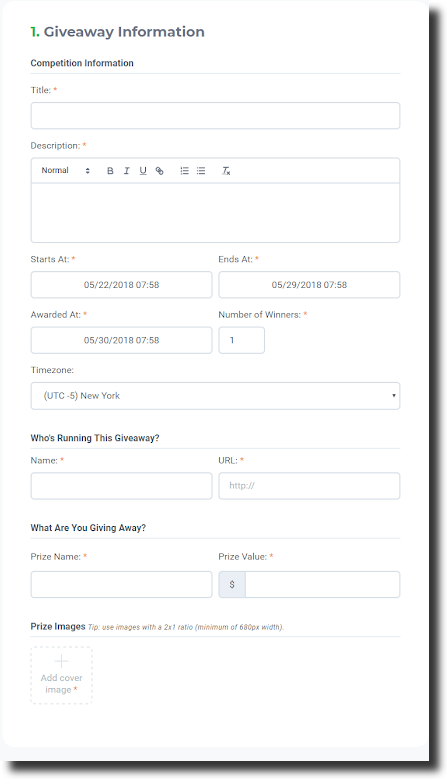 For example, put text, images, or videos surrounding your giveaway. Or, use a Sumo popup or Smart Bar to give special offers to giveaway entrants. Next, you can embed a widget tab on your website completely FREE! You can embed the badge on any (or all) your page and it floats. Your website visitors won’t miss it. If you want to launch and promote your giveaway to virality, with beautiful photo gallery embeds and FREE embed tabs, then KingSumo is the right choice for you. KingSumo has one more feature to get you more subscribers & followers… after the giveaway ends. 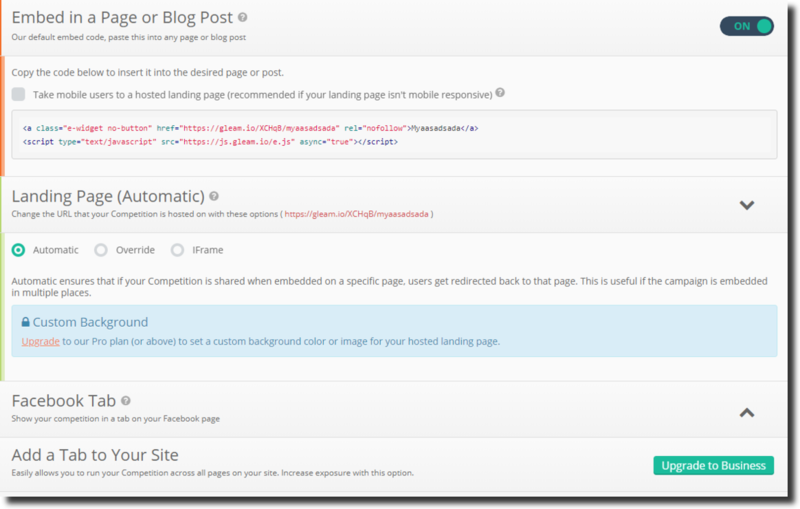 And that feature is the KingSumo post-giveaway entrant page. 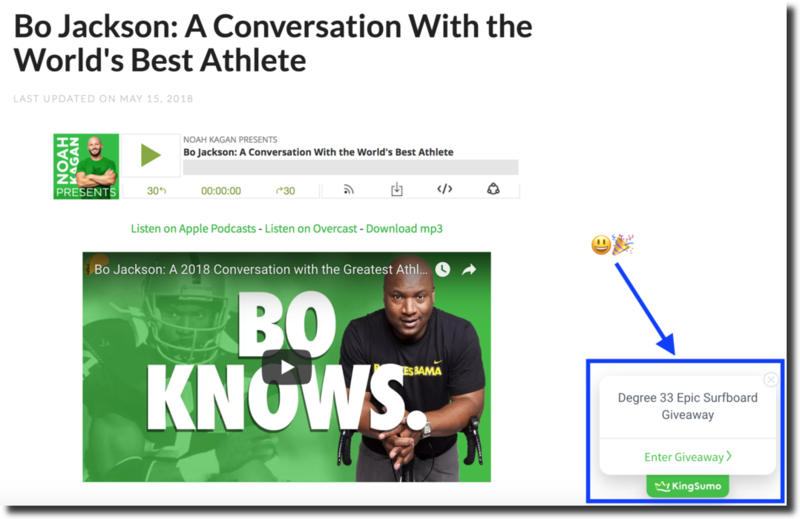 Instead of showing customers a dead end when your giveaway is over, this feature helps you get more subscribers and followers after you wrap up — automatically without any extra work. 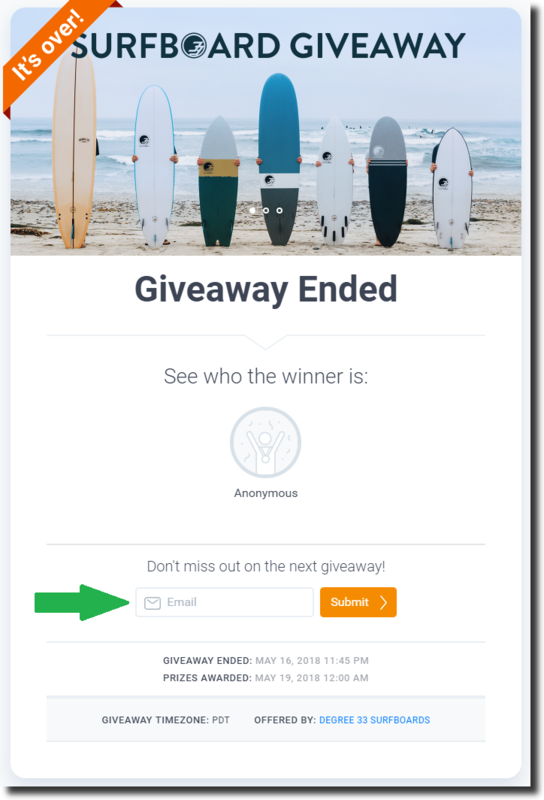 This means you can leave the giveaway on your website, knowing it’s acting as a lead-generation magnet to get more email subscribers, potential customers, and lifelong fans. Gleam doesn’t have a post-giveaway entries page — if you want to continue collecting email subscribers even after a giveaway ends, KingSumo is the best choice. For features you could get from KingSumo for FREE, Gleam charges you up to $4,788 per year! If you want a FREE Gleam alternative that’s simple to set up, packed with premium features, and ready out-of-the-gate to grow your revenue, social followers, and email list… check out KingSumo. Check out 5 new features we’ve added to KingSumo! 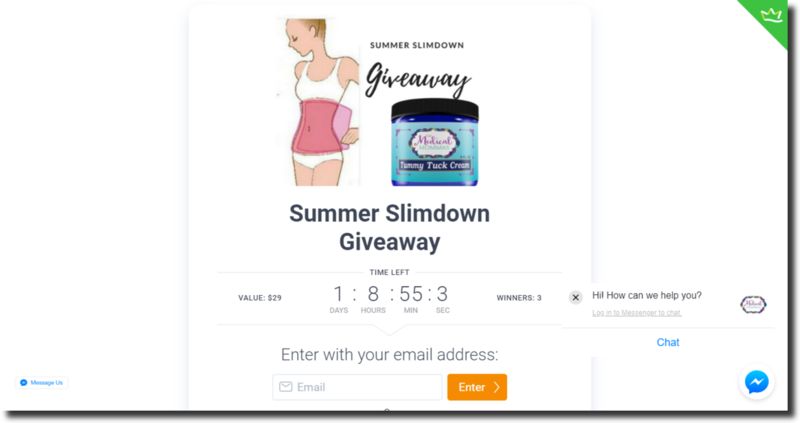 Get your website visitors to notice your giveaway. Embed a giveaway badge across one, some, or all pages of your website. To use the badge, simply paste the below code into the HTML of any page of your site. Have an entrant watch a video as a bonus entry. Even better, the video will play on the page! To try on your next giveaway, just chose “Watch a YouTube video” under Bonus Entries. Get more subscribers or customers after your giveaway ends. With this new feature, a user can still give you their email address after a giveaway ends. These latecomers will be marked “Late” in your contestants CSV. Or if you use MailChimp or Zapier, the late entrants will be sent straight to those tools. Facebook Messenger is now a default Share option when setting up a new giveaway. This means more people sharing with their friends… which means your giveaway grows! Use tools from our sister company Sumo to promote your giveaway FREE. You can use Sumo popups, Scroll Boxes, and more to turn website visitors into entrants. Click “Use Sumo” on the Promo page after you launch your next giveaway. Click here to start a giveaway and try the 5 new features yourself. Rafflecopter Alternative: How Does KingSumo Compare? You know about Rafflecopter for running giveaways. Today, we’re going to talk about Rafflecopter alternative KingSumo. A recent giveaway creator used KingSumo to increase their social followers 377%. 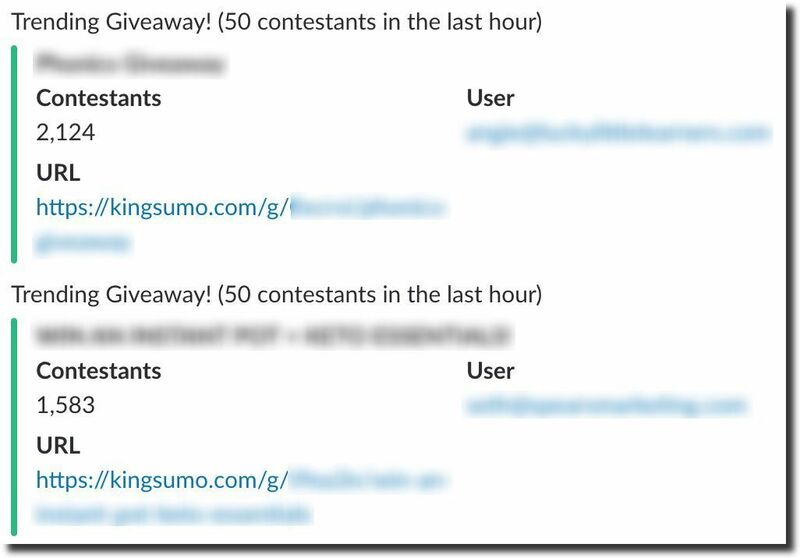 And another giveaway creator used KingSumo to get 19,830 email subscribers. In this blog post, we’re going to talk about Rafflecopter vs. KingSumo. We’re breaking down the biggest features, step-by-step, and comparing them so you can make the best decision for your website, brand, or business. KingSumo makes it easy to start a giveaway in under 5 minutes. Just enter your email address to get going. But once you get going, there are BIG differences. Many features Rafflecopter locks behind a paywall. When setting up your giveaway, KingSumo continues with the simplicity. First, you can spice up your giveaway with an attention-grabbing headline and a mouth-watering description. This will get users to enter and share. Second, customize your start and end date to ANY timeframe you want. If you want to start your giveaway in a few weeks, no problem. Or, you can start it today! Third, add your site name and URL. This makes it a breeze for entrants to visit your website. 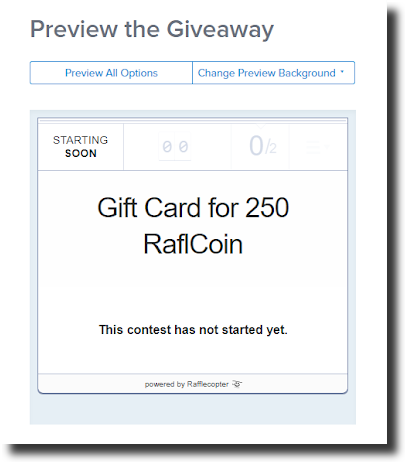 When you set up a giveaway using Rafflecopter, there isn’t much room to customize your giveaway. Want to add a description? You can’t. Want to add a link to your site? No way, Jose. Want to add beautiful images? Only for paid users. KingSumo is the best choice if you want advanced customization and options to match your brand. After you setup the basics in KingSumo, you can hand-pick your Sharing options. Sharing will help your giveaway go viral. There have been dozens of giveaways that used KingSumo to get 2,000+ entrants because of the Sharing features. 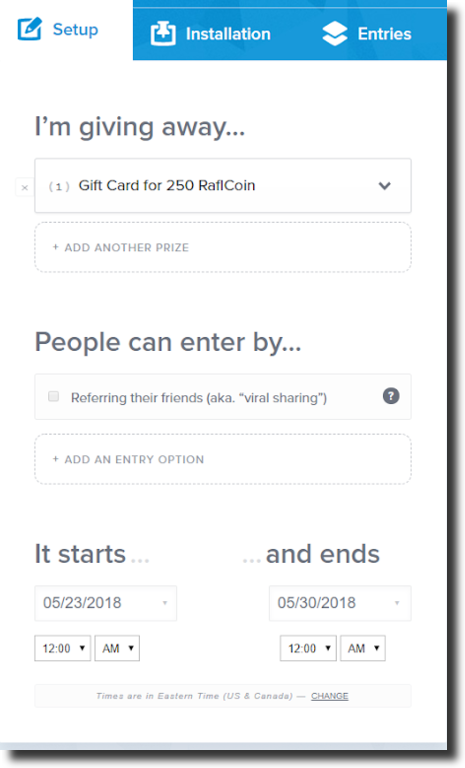 Rafflecopter has similar options to get extra points by visiting a Facebook fan page, subscribing to an email list, and more. However, many of these features are only offered it you upgrade: Pinterest, subscribing to a mailing list, and answering a poll are all paid-only options. But where Rafflecopter stops, KingSumo keeps going. KingSumo uses Bonus Entries to give giveaway creators tons of freedom to create actions that help grow their business, website, or social following. After you’ve setup your giveaway, it’s time to launch it to your fans and help it go viral. On KingSumo, you’re shown an actionable step-by-step marketing checklist so you know what to do next. With one click, you can start promoting by sending your contacts an email. Rafflecopter is missing this feature. Next on KingSumo, you can embed a giveaway badge on your website completely FREE. 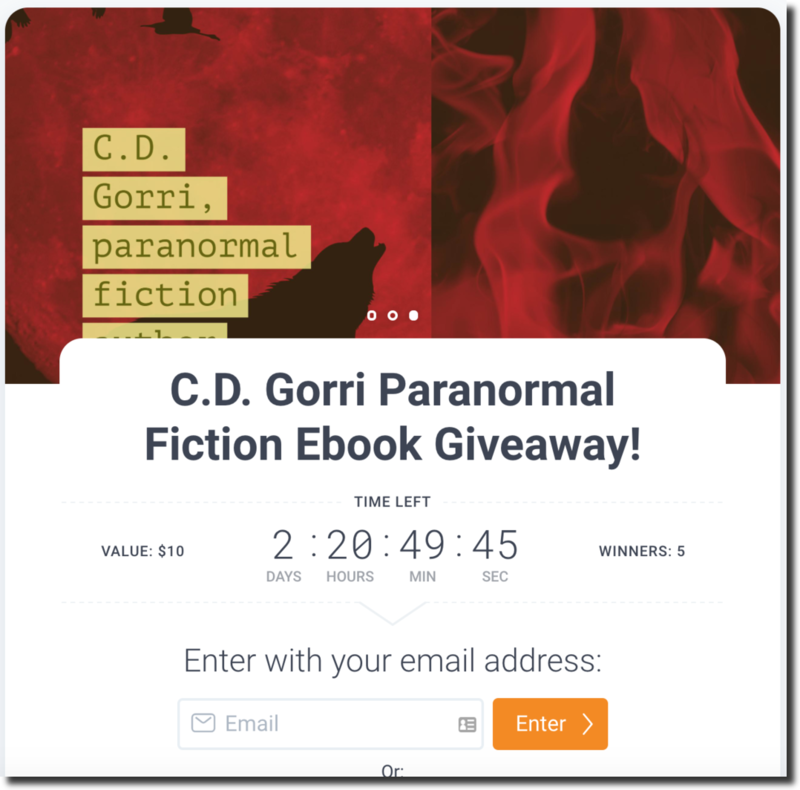 This will drive people to your giveaway, and the badge can be placed on any (or all) pages. Rafflecopter doesn’t have this feature either. Another option with KingSumo is using the embed widget code. You can embed the code on any page of your site, giving you full control over where to show off your giveaway. For an ultra-effective “1-2 Punch”, you can use the giveaway badge plus the embed widget code. The simple winning combination is embed the widget on a landing page, and use the badge on all others. 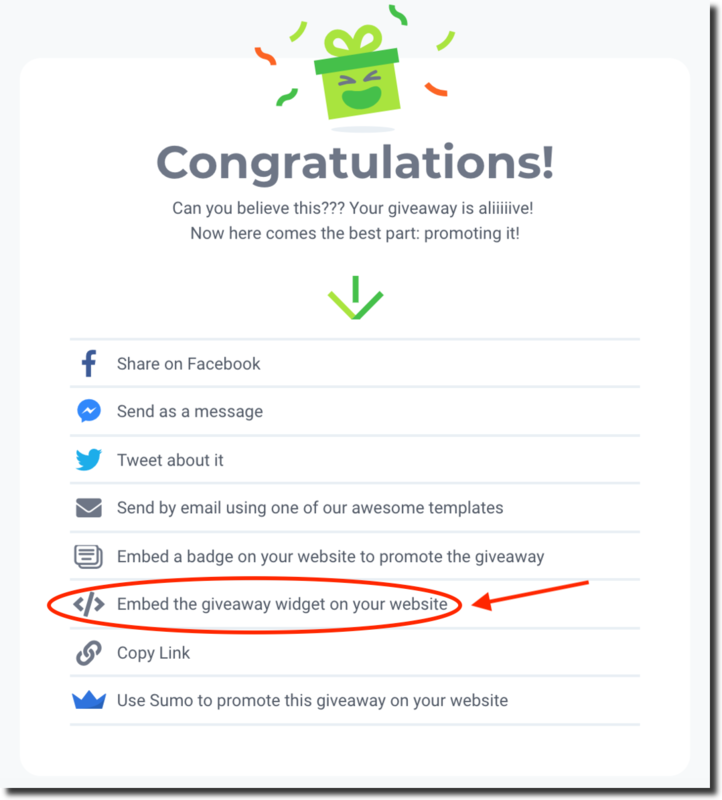 Rafflecopter gives you an option to embed a giveaway widget… but it’s limited. 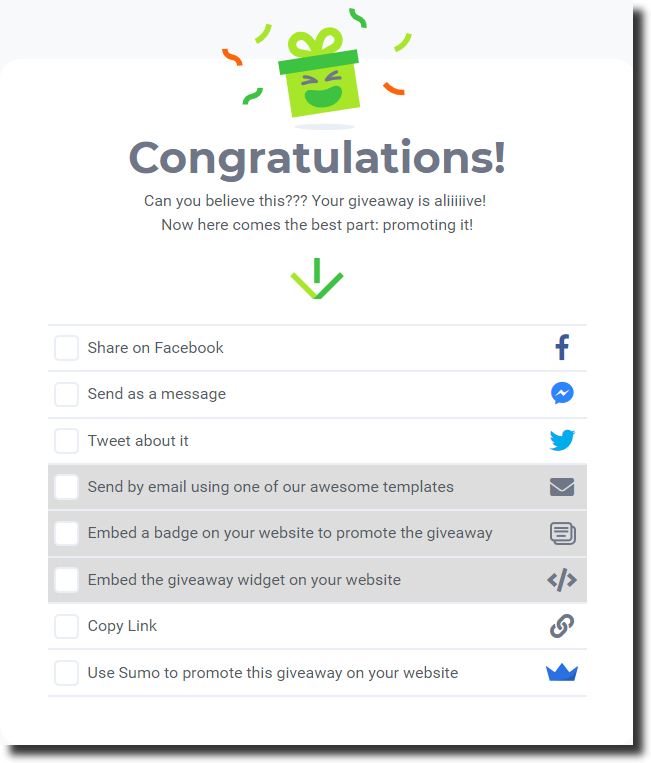 If you want to launch and promote your giveaway easier — including using beautiful embed badges and widgets — KingSumo is your best choice. Who says the fun stops when your giveaway is over? After you’ve launched and gone through the promotion checklist, there’s one more trick up KingSumo’s sleeve. 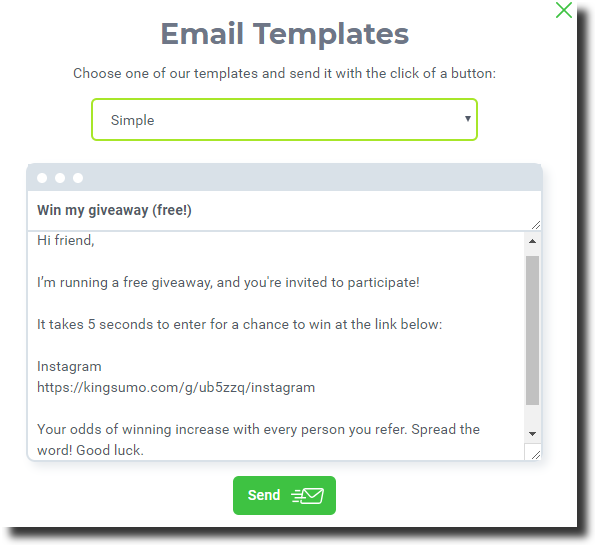 The KingSumo post-giveaway entrant page was designed to get more email subscribers and followers to your giveaway… after a giveaway is over! Even AFTER your giveaway ends, you can keep collecting email subscribers. And when you get more email subscribers post-giveaway… you can get more customers and leads automatically and with no extra work. Post-giveaway entries is a feature that Rafflecopter doesn’t have. To recap, here’s how the free version of KingSumo stacks against Rafflecopter. Rafflecopter charges you up to $1,008 per year for features KingSumo offers for $0! 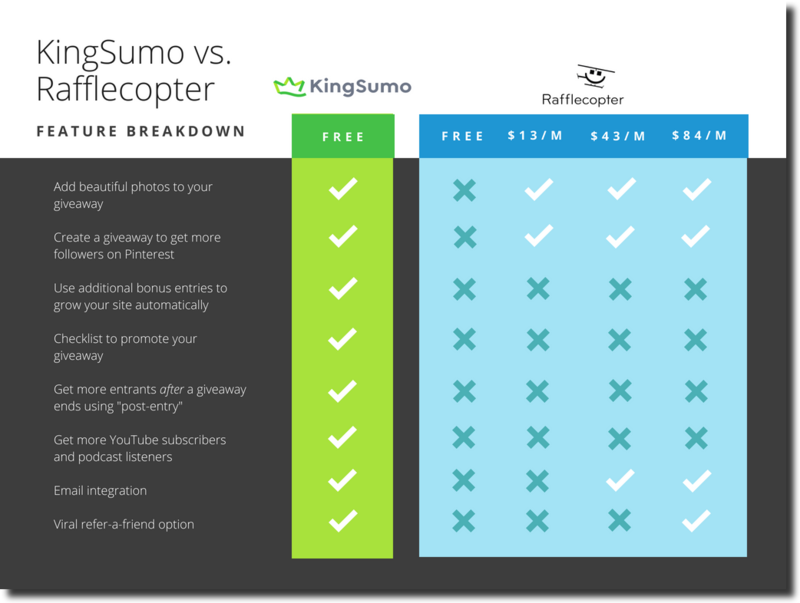 If you want a Rafflecopter alternative that’s simple to use and effective to grow your email subscribers, customers, or social followers — KingSumo is the best choice for you. How would you like to see your follower count go up like this? Giveaways helps people and brands grow their social following. And today, we’re gonna put giveaways head-to-head with other popular marketing tactics. See for yourself which strategy is the fastest and cheapest to get you you highly-engaged social followers. Buying followers might sound cheap and effective… until you notice it gets you zero engagement. Hootsuite did a test buying followers… and had some surprisingly depressing results. They started off buying 1,000 followers for $9.95. At first, this seemed great. But after a few months, not a SINGLE “follower” liked or commented on any of their photos. When you buy followers, you aren’t buying customers — you’re buying spam bots. The amount of followers you have doesn’t matter if they’re all bots who don’t engage. That’s what a team recently did with a fiction eBook. The end result of their giveaway? 526 total entries and more social followers. Cha-ching! They kept their giveaway dead simple too. Win for entrants because they increased their chances to win. And a win for the giveaway creator because they got more social followers FREE. But there are big risks. It takes lot of time to follow (and unfollow) large amounts of people, and there are no guarantees it’ll work. Some people turn to automation — but it’s still a terrible idea. Twitter user WebTrafficCafe shared a story of being suspended on Twitter partly for follow-unfollow automation. The worst part: Twitter was their largest referral traffic source. Getting banned dramatically affected their brand and business. It took them 4 emails, multiple tweets to Twitter Support, and almost 3 weeks of waiting just to get the explanation email. In the end, they had to create a new account from scratch. Back to square one. Don’t get suckered into the “follow-unfollow” trap — there are faster, cheaper and safer ways to grow your social following, including giveaways. For example, a giveaway user named Marie gave away a collection of her books. From her simple giveaway, she got 5,357 entrants and HUNDREDS of new Instagram followers. To get started, she made a simple offer. No fancy pictures or epic content — just listing her home items to give away. Next, she set up a bonus entry for entrants to follow her on Instagram. After anyone entered the giveaway, they had a chance to follow Marie for extra chances to win. This simple one-two punch did great. Marie’s follower growth was 377% higher than normal during her giveaway. She kept it simple by only promoting Instagram. But if she wanted her Facebook, Twitter or YouTube to grow, all she had to do was add her other social profiles to the giveaway, too. While running bots may save you time because you don’t have to manually follow-unfollow, it can turn awkward REALLY fast. Hootsuite ran an experiment that used automation software to comment on photos with certain hashtags. But then the downside hit. 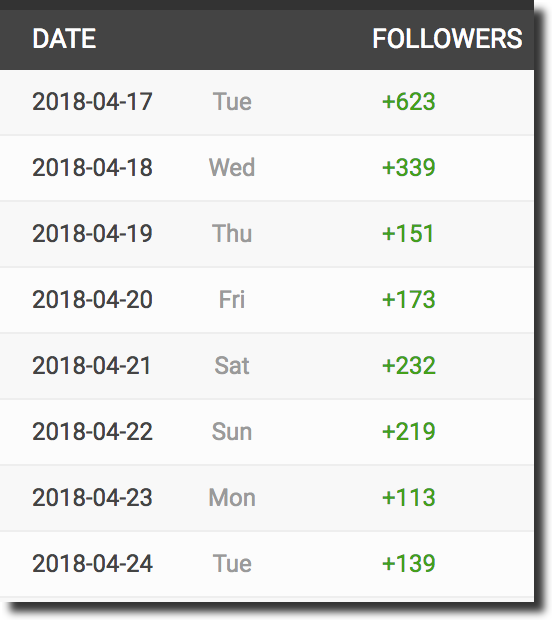 The final result was he gained 250 followers in 3 days… but the bot had to follow over 1,400 people in order to get those followers. Plus, those new followers didn’t equal engagement. Compare this to running a giveaway and setting up a special tweet to get more followers, like New York Times bestselling author Ryan Holiday did. This custom message text helped push Ryan’s Twitter following to the next level. How do you find influencers? How do you send a compelling email so they WANT to help you? After all that effort… how do you even know it’s going to work? Finding an influencer takes a lot of time and effort. We know because we’ve tried influencer marketing in the past. Even with really warm leads we at most average a 50% response rate. Look at all those failures! If you decide you want to pay an influencer and avoid cold outreach, it can save you time… but it’s expensive. And when you pay for an influencer, engagement isn’t guaranteed. Instead of wasting money or time on influencer outreach, a recent author launched a Walking Dead Super Fan giveaway. To get more social followers from his giveaway, the author set up a few simple bonus entries for entrants to follow on Facebook or Twitter for more chances to win. Maybe you’ve been learning a lot about online marketing and think you know how to grow organically. You get started… and you realize it takes TOO LONG. Posting 10 times per day and using hashtags is time-consuming. To grow organically, it often takes months or years waiting for your lucky break. Giveaways can grow your social following EASIER and FASTER. For example, a recent giveaway creator grew their social following by 2,500 in a few weeks using a simple bonus entry. Last year, we ran Facebook Ads for another one of our businesses. And we averaged $4.65 per new follower. Ouch. And as the Facebook Ads platform changes because of all of Facebook’s privacy issues, the competition is gonna be more intense. For many online advertisers, Facebook advertising is going to cost you more time and money. 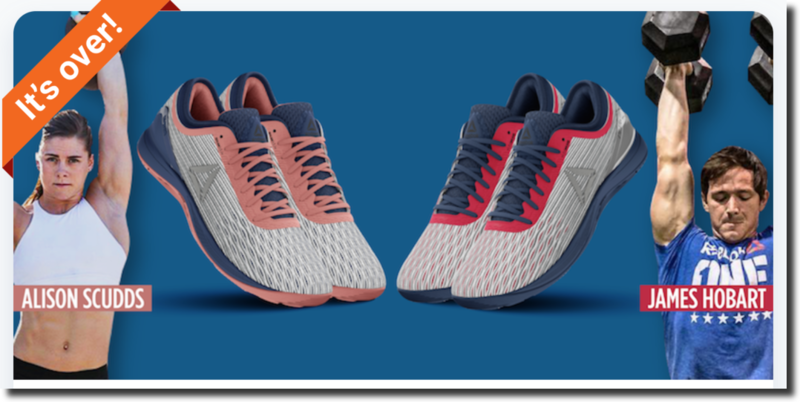 As a Facebook Ads alternative, one company decided to give away recent a pair of athletic shoes and a sports recovery drink. The giveaway got 3,226 entrants and only cost $200. That’s $0.06 per entrant, many of whom can be turned into social followers by asking them to follow their social pages for more deals. Growing organically can take months or years to get any traction — one of our account we saw only grows one follower per day! Do you really want to wait 2 years for 700 followers? Instead of wasting time or money trying to grow your social following, use giveaways to get more followers quickly and inexpensively. It’s possible… and today, we’re going to show you how. Even better, we’re NOT going to show you any questionable “hacks” or immoral strategies that get you banned from your social channels. HUNDREDS of people have increased their Instagram followers, Facebook fans, Twitter followers, YouTube subscribers — and more — using viral giveaways. In this post, we’re going to show you how to use FREE viral giveaways to grow your social followers. With viral giveaways, there’s a magic secret you can use to easily get more social followers. And there’s no catch — you don’t have to buy these followers. 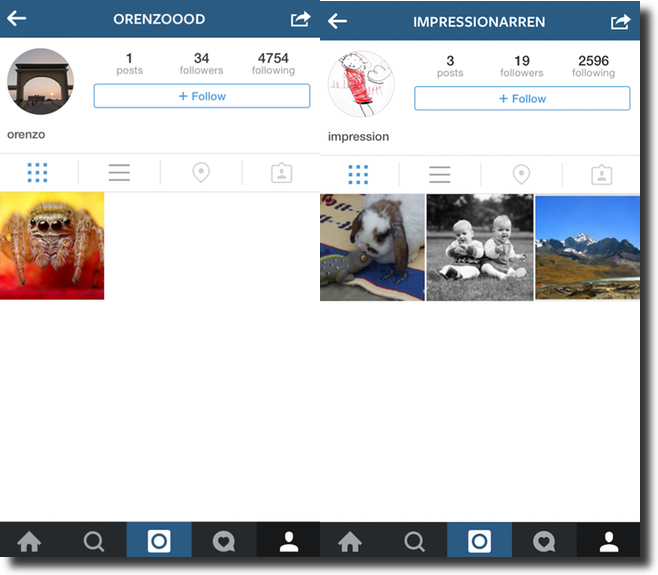 No spam bots, no follow-unfollow nonsense… no tricks or games. These are REAL followers who actually want to follow you (and they’ll like your pictures). To get these followers, you can use a simple giveaway strategy called bonus entries. Using viral giveaways, you can set up bonus entries to push people to follow your social channels. It gets entrants to take ACTION on the things you want — like following you on Twitter, Facebook, Instagram, and elsewhere. More social followers! Sometimes, we all need a little push. Help people fall in love with your brand and content! 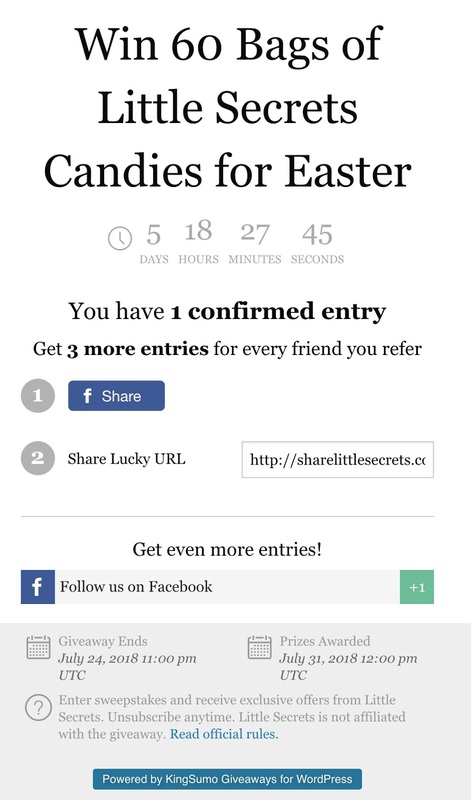 You can also give bonus entrants when people share your giveaway on social channels. If people tweet out your giveaway, they get a bonus entry. If people post on Instagram, they get a bonus entry. The more people who share your giveaway, the more people who see the giveaway… and the more social followers you can get. Next, to take social sharing up a notch, we need to create a compelling message with some killer hashtags to make your giveaway explode. 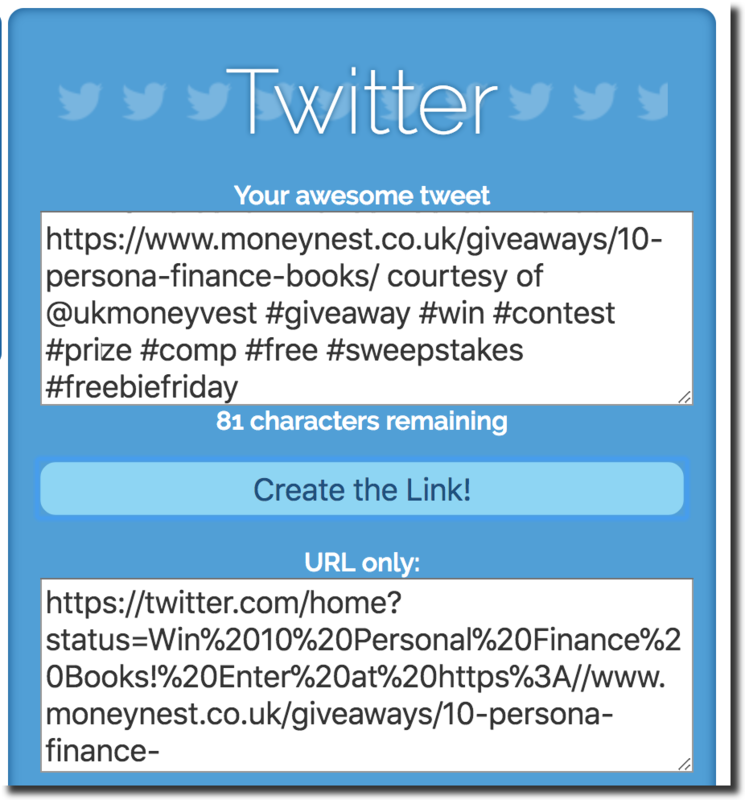 Person A shares your giveaway on social media by pasting a plain link of your giveaway. Person B shares your giveaway with super compelling “see it and immediately want to follow” copy about your giveaway. They combine the copy with high traffic hashtags that get a ton of viral traffic — plus a compelling link to your irresistible giveaway. Imagine if you could get every single share on social media like Person B’s post. BOOM! 🎉 That would be $$$. You don’t have to pray and hope your giveaway reaches a professional marketer to get the Person B treatment. 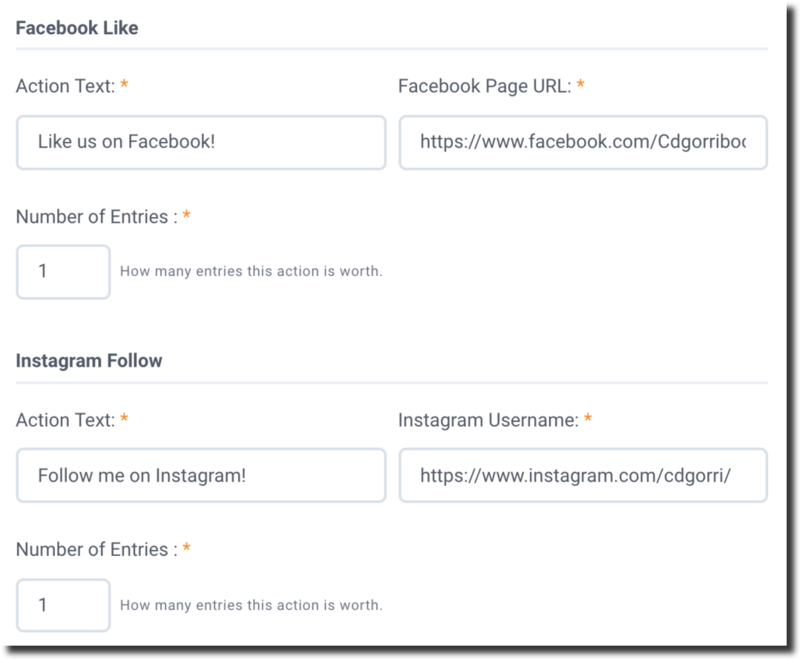 Instead, you can control what everyone shares about your giveaway on their social pages. And better shares = more social followers for you. All you have to do is craft your message once, create the link… and profit forever from it. You can do this by manually creating links for your favorite social media platform — or using a tool like Share Link Generator to make it easier. When you create a compelling custom share link your followers can share, your followers will promote your message for you. It’s like free marketing help! And when it’s compelling enough, it’ll get tons of viral attention… without any work from your side! If you want to create a custom share link for Twitter, and add more flame to your Twitter share bonfire, start by finding effective hashtags to create a GREAT tweet that works for you. Go to Hashtagify.me and search for terms related to your giveaway. You’ll find the most popular hashtags, plus a word cloud of related hashtags. Take a few of the bigger hashtags and run them through Hashtags.org to measure their popularity. You want every hashtag you use to be guaranteed traffic magnets, so we recommend only using hashtags that get 100+ tweets per hour. Narrow down your list of hashtags to the 3-10 most popular hashtags. Sprinkle the winning hashtags into your custom URL (or use Share Link Generator) along with mouth-watering copy. Set up your customer URL in your giveaway as the share message to get bonus entries. This guarantees a successful message. Every time people share your custom message on social media… each post will get viral attention from users searching for those popular hashtags. 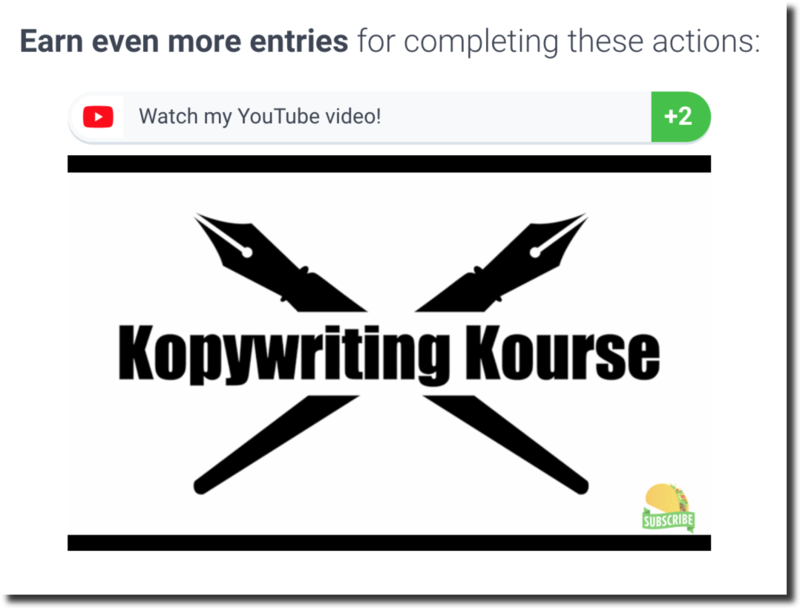 And because your copy is compelling, it’ll get people to click your giveaway, enter… and then follow you on social media using the bonus entries you already set up in step 1! Now that you’ve primed your viral machine, it’s time to send out that first killer email to get even more of your friends sharing. If you want more social followers from your giveaway, you need more people seeing it. 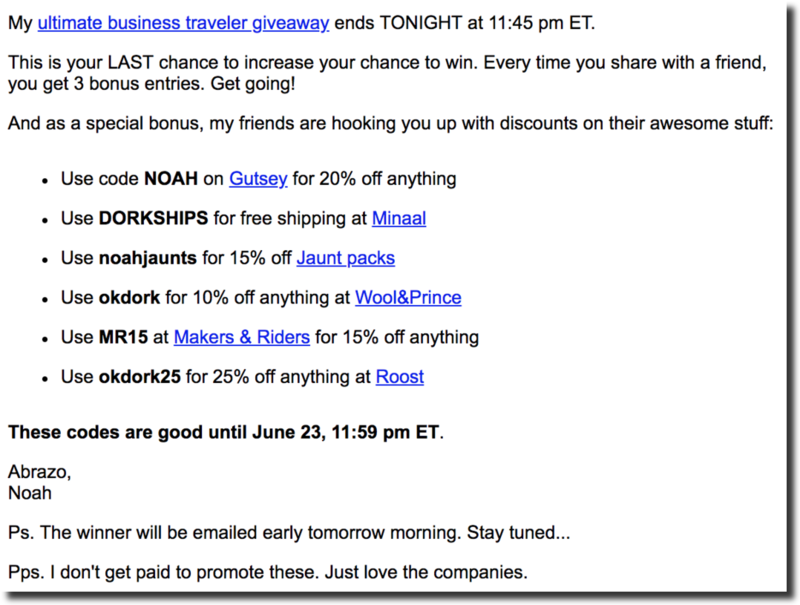 One of the best ways to get more attention to a giveaway is through email. You don’t need a big email list. You don’t need to be super popular (no Homecoming King here). You don’t need to be a professional email marketer. Even if you send to only a few dozen friends, your first email will send tidal waves and kickstart the initial traction for your giveaway. Look through your Google contacts. Check your recent sent emails. Who are you contacting the most? Think specifically about friends and family. Look at your LinkedIn connections. You can pull email addresses from LinkedIn. Look for people who have jobs or interests related to your giveaway item. Even if you don’t know the person very well, sending an email is worth it. Get influencers to email for you! Find people you admire or follow online. Email them and ask if they’ll help email your giveaway to their fans. In return, you can mention them in your giveaway, in your emails, or on your social channels. You can also use a tool like Hunter.io to find more people to email. I’m running a free giveaway, and you’re invited to participate! Your chances of winning increases when you follow me on social (or refer someone to the giveaway). Spread the word! This may sound simple, but sometimes simple works best. When you’re using a giveaway to get more social followers, it’s important to post on the channel where your followers are. You can find your ideal followers on the same platform you’re promoting! To celebrate May, we’re launching a new giveaway. Giveaways are a GREAT way to grow your social following. They’re simple, inexpensive, and extremely effective. Do Viral Giveaways Actually Help You Get More Followers? For many people, giveaways are a new and different marketing tactic. Everyone knows about SEO, online advertising, and social media. 30% of AppSumo’s revenue for years came from giveaways. This is how AppSumo bootstrapped their business to an 8-figure company. Giveaways were the best ROI in all of the early AppSumo marketing strategies. 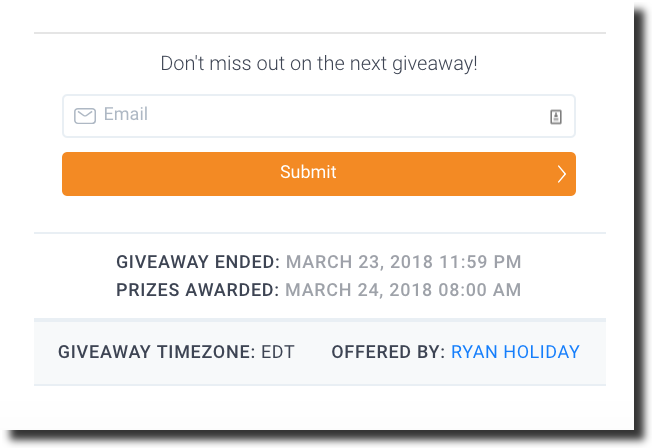 When you’re launching a new product, giveaways can help you get new customers: Ryan Holiday ran a giveaway last month and got 6,144 subs in two weeks. Over past few years, giveaways have helped grow Noah Kagan’s personal email list by 52,919 email subscribers. Giveaways are one of the BEST ways to grow your business and brand for nothing. And in this post, I’m going to share three misconceptions about giveaways. Any marketing channel can lead to bad subscribers or customers if you set up the wrong targeting. Just like targeting your Facebook Ads or Google SEO keyword strategy correctly, targeting is important with giveaways too. To make an uber-successful giveaway, choose a narrow product your IDEAL customer wants. 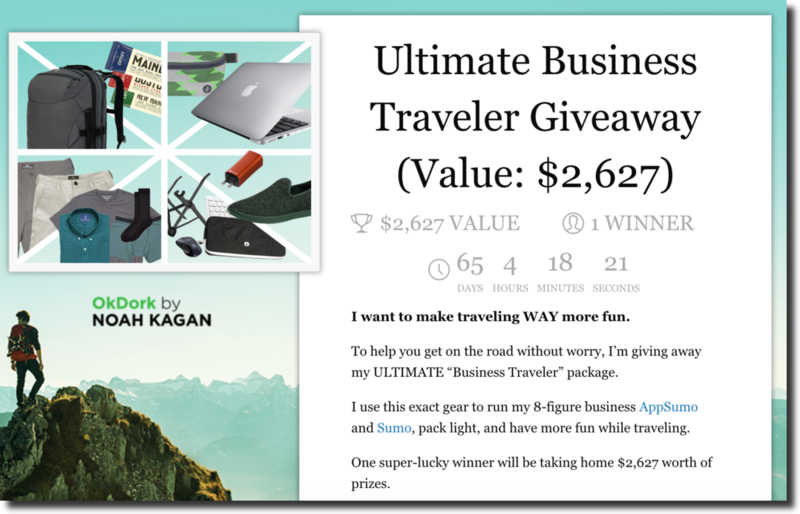 Noah Kagan’s audience is interested in travel and entrepreneurship, so he created an Ultimate Traveler giveaway that generated 23,127 entries. A California surf company is running a giveaway for a new surfboard and accessories. All entrants in this giveaway are super targeted for their niche audience. Focus your giveaway on your niche or target market — like Facebook ads, when your targeting is too broad, you get bad results. For example, if you give away an Amazon gift card or iPad, that may be too broad. But when you focus specifically on what your audience might WANT or NEED, you can build a list of perfect subscribers for your business and drive incredible ROI from giveaways. Some people think giveaways “destroy” email lists. When you use proper email list cleaning techniques, your reputation won’t be damaged at all. The team at AppSumo has grown an 8-figure business from giveaways. And so has Sumo. Clean inactives. To make sure your email list is super clean and your deliverability never suffers, we recommend removing anyone who hasn’t opened or clicked an email in six months. After six months, old inactive emails can become spam traps. Keep your list clean! It helps… but you can still run an ultra-successful giveaway with a small audience. 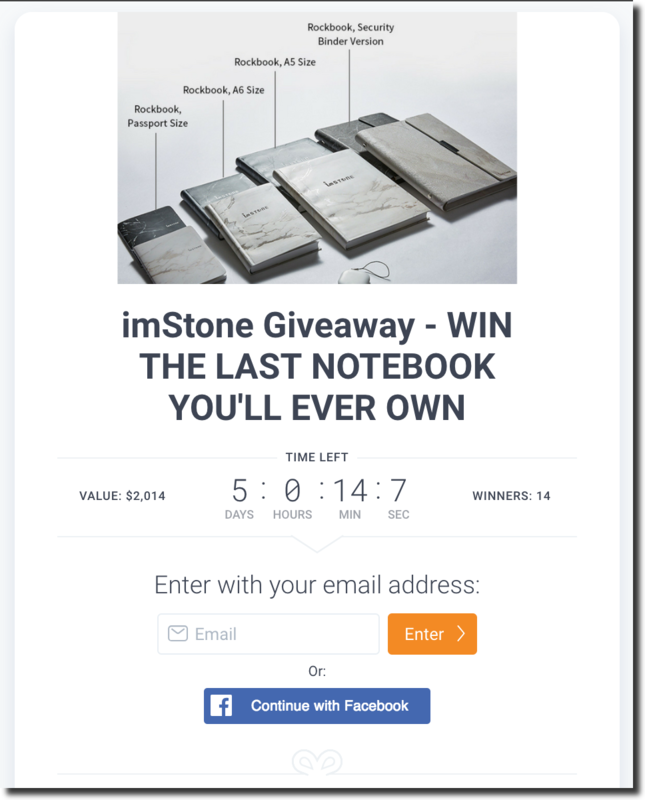 For example, a small notebook manufacturer you probably never heard of called imStone ran a giveaway that got 3,370 entrants (aka new email subscribers)! Start by using KingSumo. KingSumo is our free giveaway tool that enables you to create and promote your giveaway. Once you have your prizes in place, KingSumo will help you get your giveaway up and running in minutes. Share your giveaway across social media platforms. Your own followers are low-hanging fruit for your giveaways. 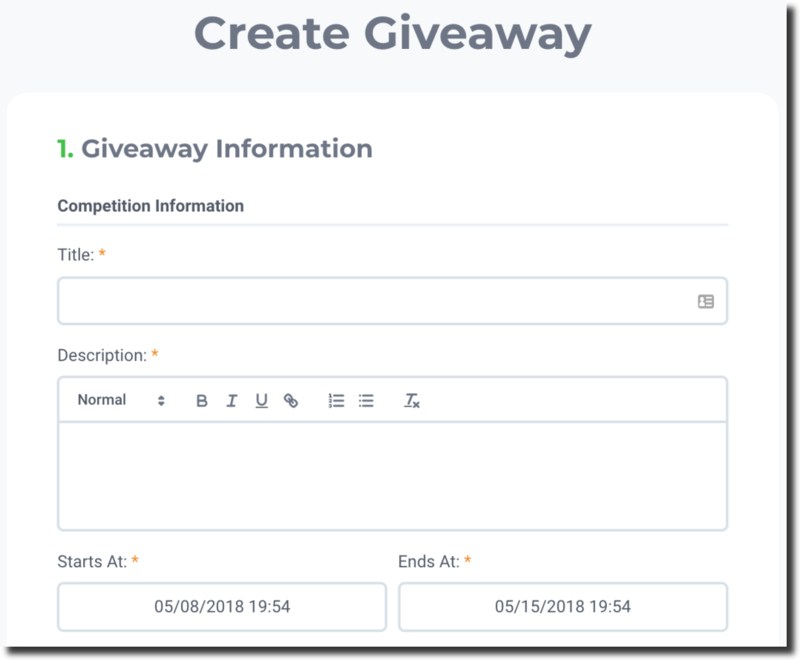 Share your giveaway with your existing audiences on platforms like Facebook, Instagram, and Twitter.Once you’ve shared it with your own audiences, try looking for some additional places to promote your giveaway. For example, Sam Jeffries shared his giveaway in a few Facebook Groups focused on his core audience. Many times, this is all they need to help promote your giveaway to their audience! A recent KingSumo was able to launch a successful giveaway using this tip… and got in front of thousands of new people because of it. First, brainstorm businesses that share the same audience as you. If you’re stuck for ideas, head over to a tool like Moz and search for key terms and phrases related to your business (Moz gives you a few free searches per day). The results will help you identify potential partners who are talking about your niche. For example, say you were running a giveaway aimed at developers and engineers. 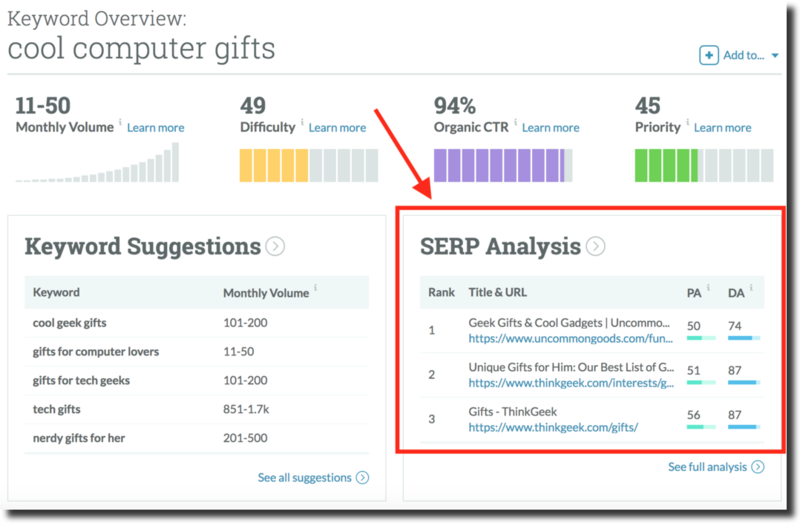 You could search for “cool computer gifts’ and Moz would show you the pages ranking highest for those keywords. Once you have a list of relevant products and companies that you could partner, it’s time to find their email addresses so you can get in touch. You can Google around or use a tool like Hunter to save time. All you need to do is enter the company name and Hunter will show you the email addresses of people at that company (you can even search for specific people). Now that you have the contact details of everyone on your list of potential partners, it’s time to drop them a message. I LOVED your book. Read it a few times, my favorite part was where you shared advice on negotiating a raise. I’m running a giveaway for my readers. Gonna promote to 1,000+ on my social and email channels. Would be excited to give away your book + link to your site. Promote the giveaway on your website using a Smart Bar to spread awareness of the giveaway and encourage entries. When some people think about “giveaways” they think BIG. These prizes might sound great… but they’re often unnecessary. For example, Noah Kagan recently generated 6,411 email subscribers by giving away a Seth Godin books collection that cost about $80. In other words, it was WAY less expensive than other marketing methods. Aim to provide prizes that appeal ONLY to your specific niche. 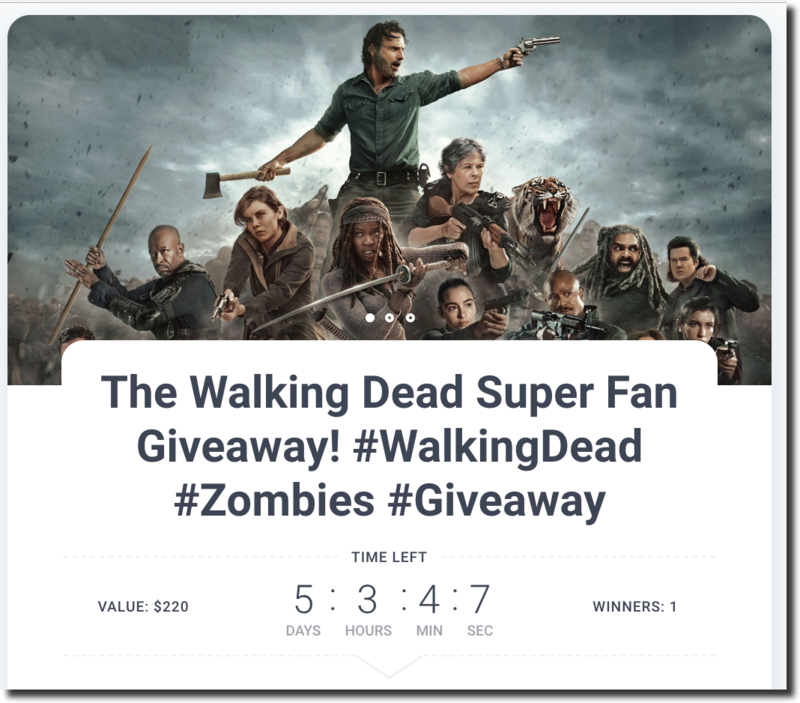 For example, a book company ran a “Walking Dead Super Fan” giveaway and generated 2,236 entrants. The more your prize appeals to your audience, the more likely your giveaway will spread virally and through word of mouth, too. Bottom-line: Giveaways work to get you more email subscribers and customers. Make your giveaway go viral from day 1. After someone enters your giveaway, we made it much easier for them to get bonus entries. Create bonus entries to get more people to your site, social channels, buying your products, and more! After your giveaway goes live, you’ll get a new optimized launch checklist. When you follow the checklist, your giveaway has a higher chance to get more entrants. More entrants = more email subscribers and customers! We made it easier for giveaway admins to control sharing options — and help make a giveaway popular from the start. Enable or disable any sharing platforms you want (like Facebook or Twitter). We also separated sharing options from bonus entries so it’s cleaner and easier to configure. Giveaway entrants get a reminder halfway through the giveaway, and on the final day. These entrant reminder emails are now better than ever. 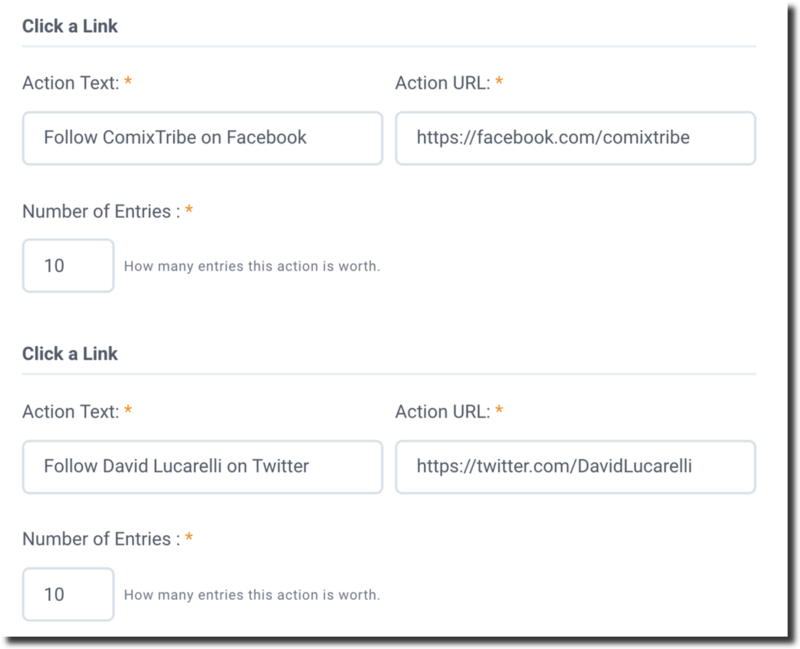 All action links go directly to the action instead of the Entrant page. For example, if an action is “Tweet your followers” it opens up Twitter directly. We want to help your giveaway get more entrants… automatically. To help, we made the default Twitter share text for both entrants and admins include popular giveaway hashtags #giveaway and #win.